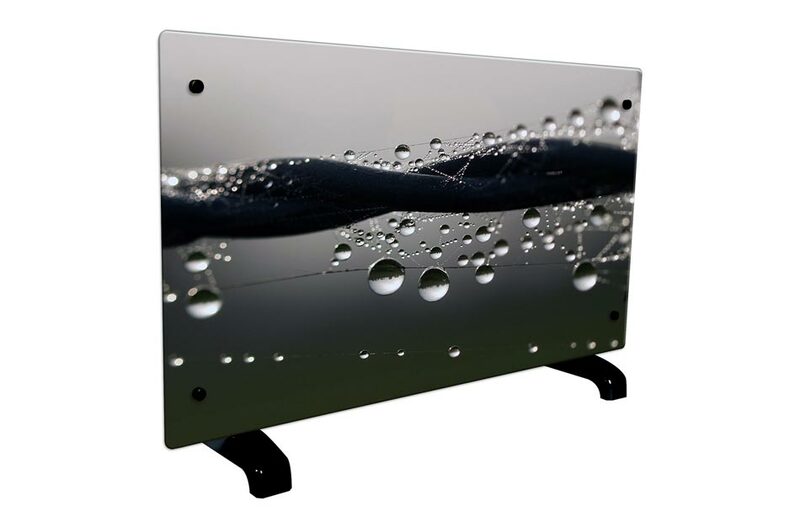 With its decorated and interchangeable glass front, it fits in any interior, whatever the decorative atmosphere. 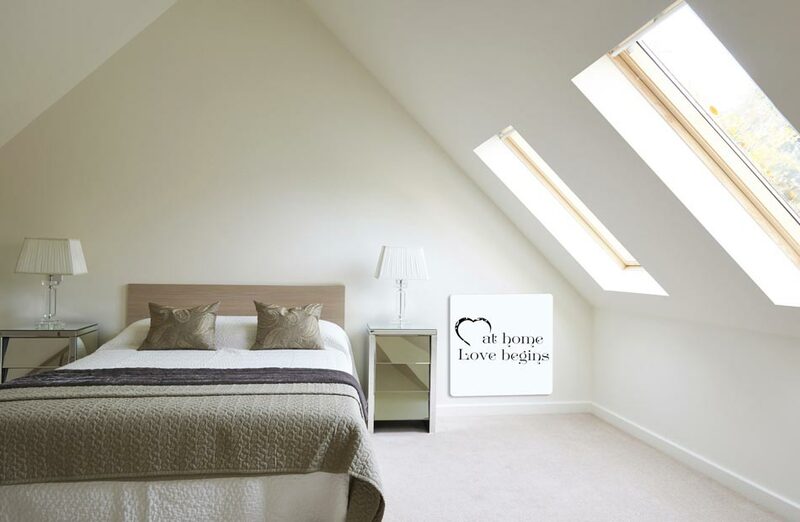 Loft spirit, natural desire, material effect or graphic print, every space can accommodate it. 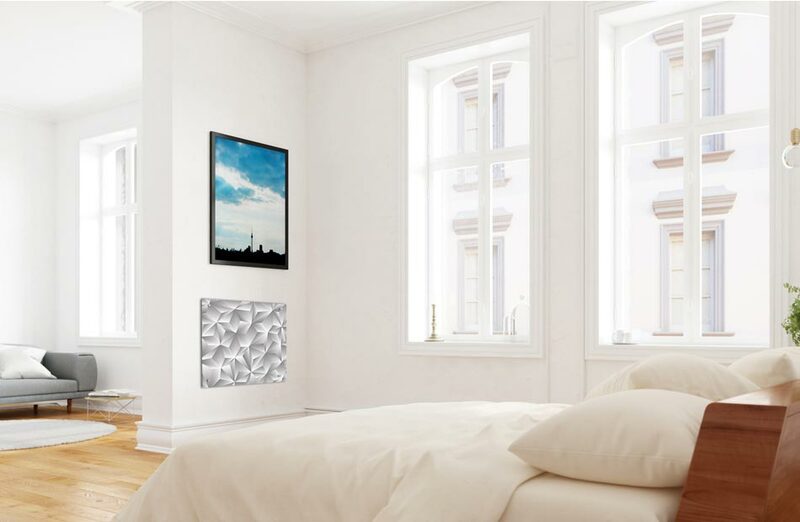 Its thermal performance and low consumption make it the ideal ally of all decoration lovers concerned about their comfort and the environment. 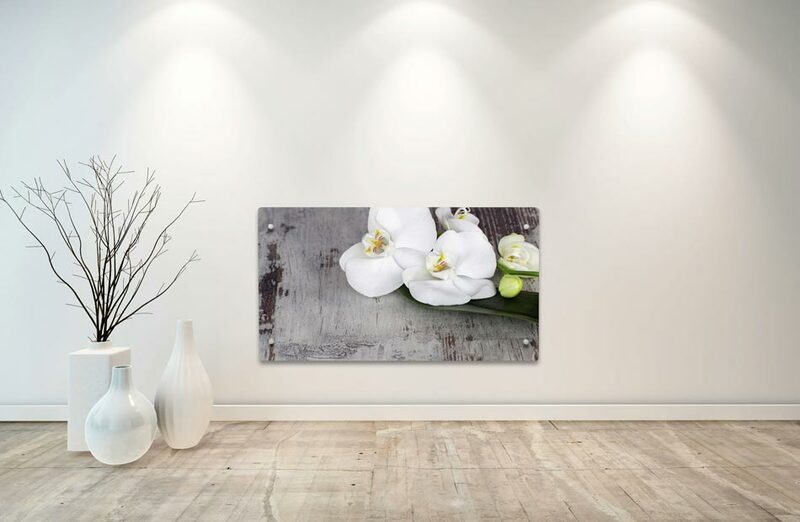 You can discover our entire 2018 collection on our website, and at our partner distributors. 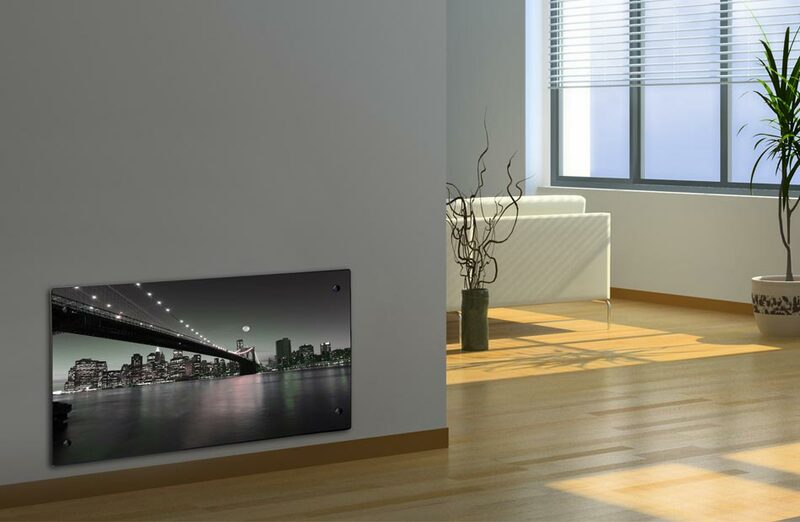 Electric heaters lost their energy waste reputation! 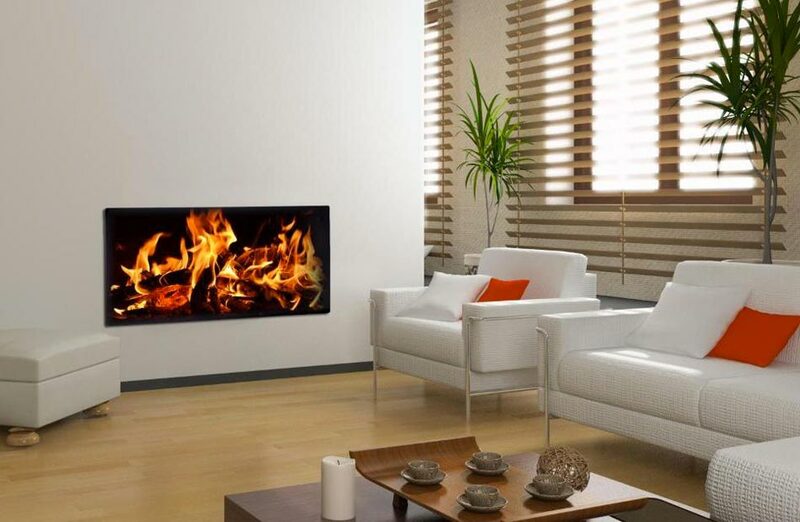 Today, the trend is electric heater, it offers numerous possibilities in terms of decor and installs in minutes. 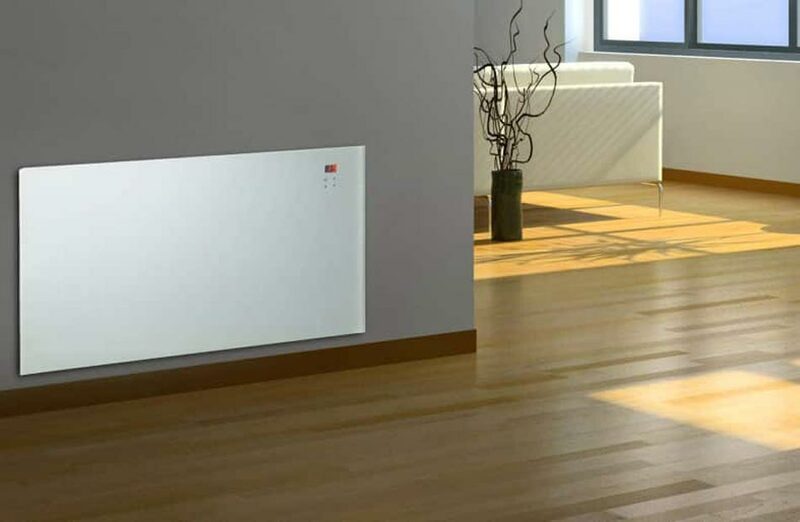 In the bathroom, it is essential to have a fast heating means, which consumes little. 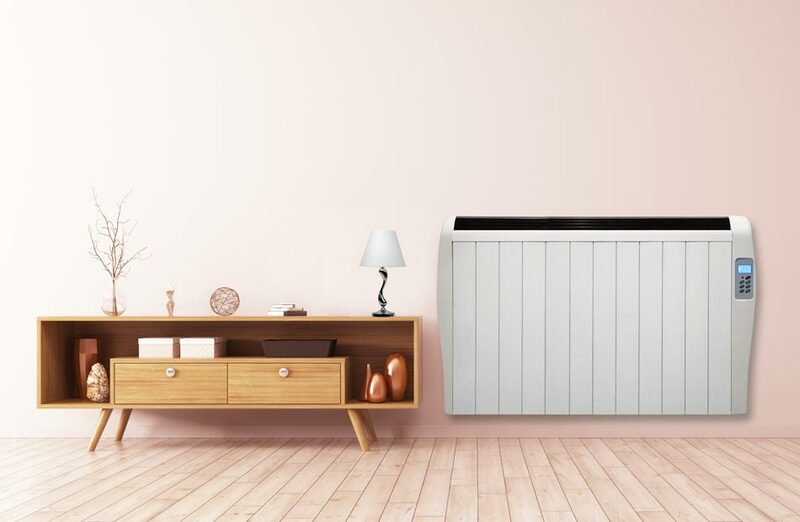 The inertia decorative radiator emits a soft and regular heat: thanks to this technology, it provides excellent thermal comfort without drying the air. 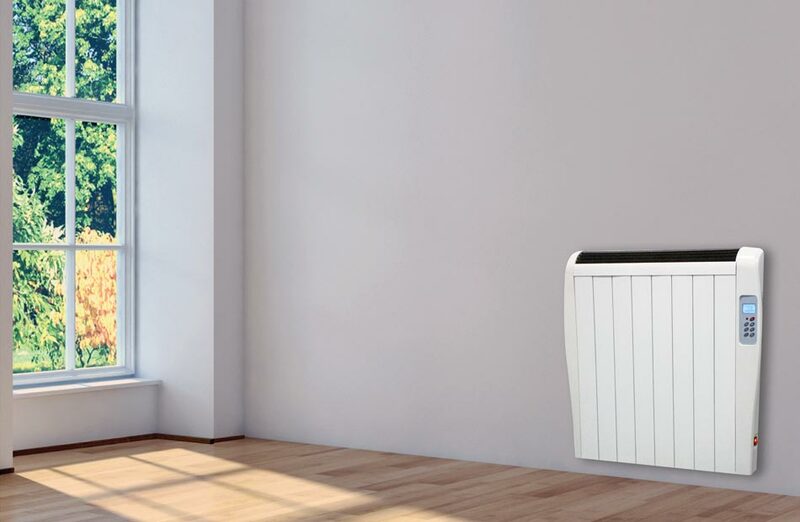 Conceived and designed to integrate your bathroom, this electric radiator meets the standards and offers total security. 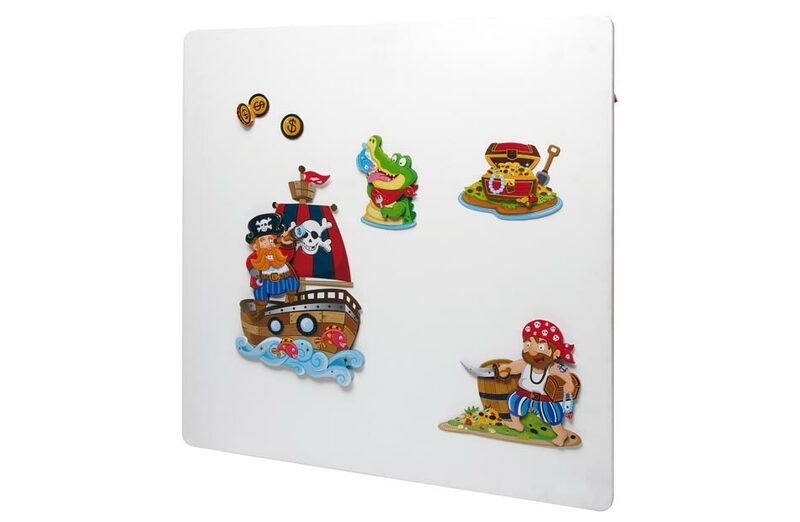 It can be set to the wall in less than twenty minutes and it is fully customizable: it can be painted, but you can also add stickers on the front! 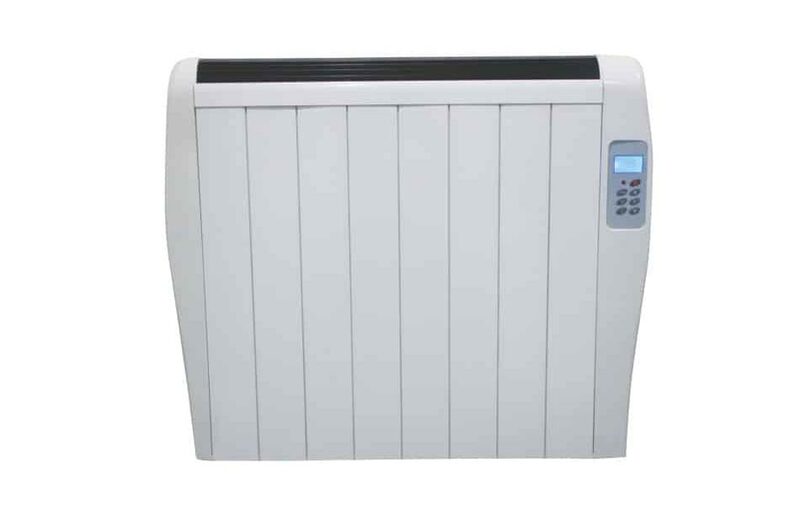 This electric radiator with radiant panel heater ally sobriety, heating performance and optimal comfort. The radiant technology give a sensation of very pleasant, soft and immediate heat. 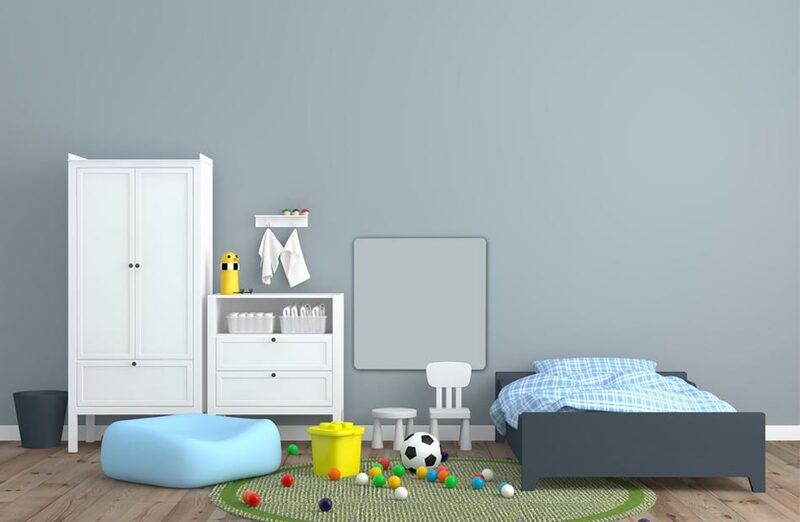 The air remains healthy, and always at the ideal temperature, because you can adjust the thermostat according to the desired temperature in your room. 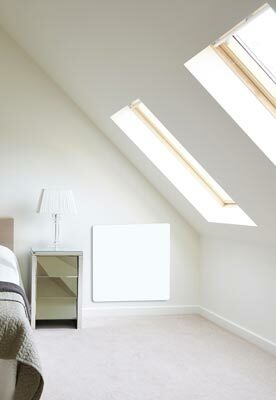 The power of this radiator suits for a room of 7m2 approximately: a small room or a big bathroom for example. 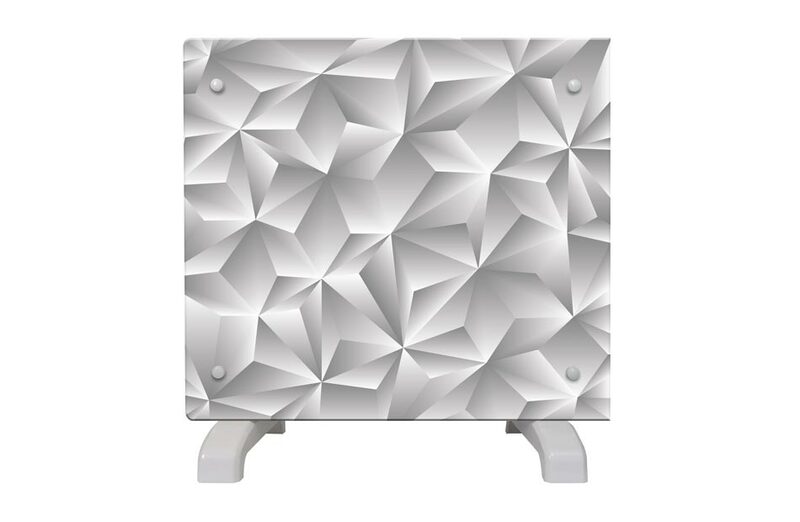 The very discreet design of this model also authorizes you to customize it, because you can paint it, decorate it with stickers according to your desires and according to the atmosphere and the colors of your room. 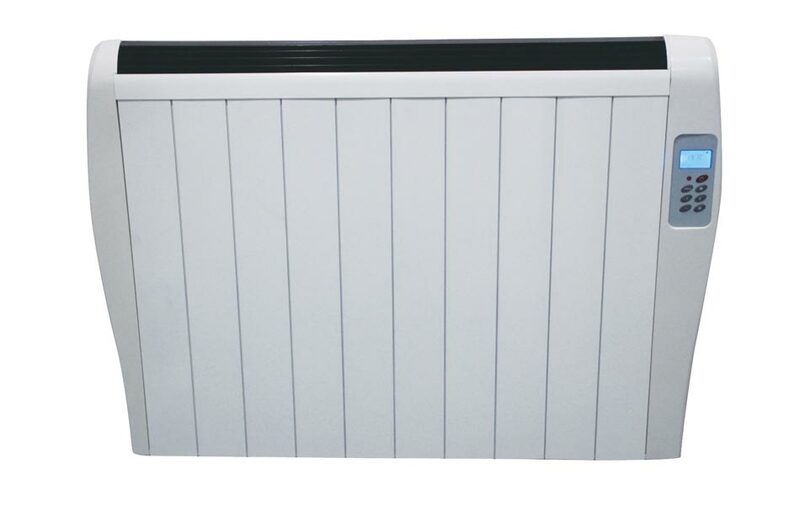 This electric radiator with radiant panel heater ally sobriety, heating performance and optimal comfort. 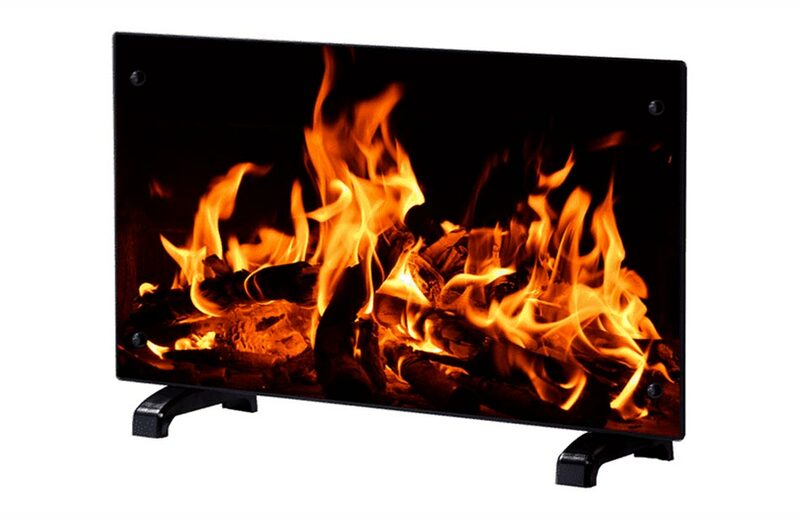 The radiant technology give a sensation of very pleasant, soft and immediate heat. The air remains healthy, and always at the ideal temperature, because you can adjust the thermostat according to the temperature wished in your room. 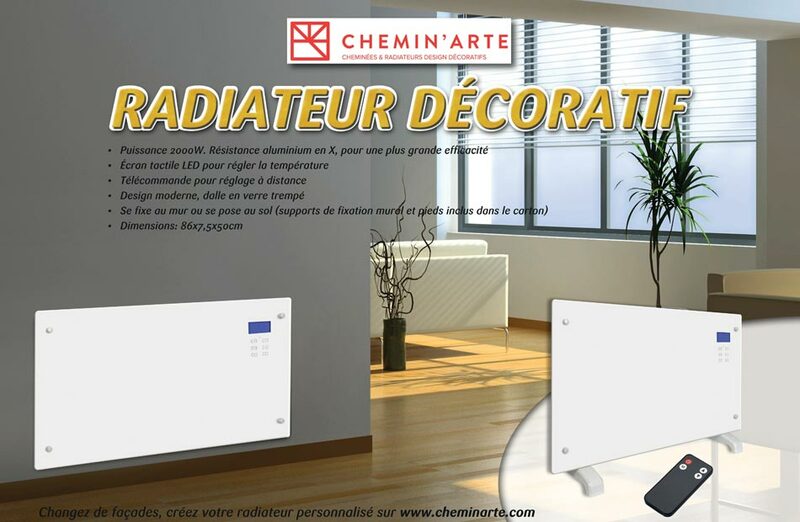 The power of this radiator suits for a room of 10m2 approximately: a small room or a big bathroom for example. 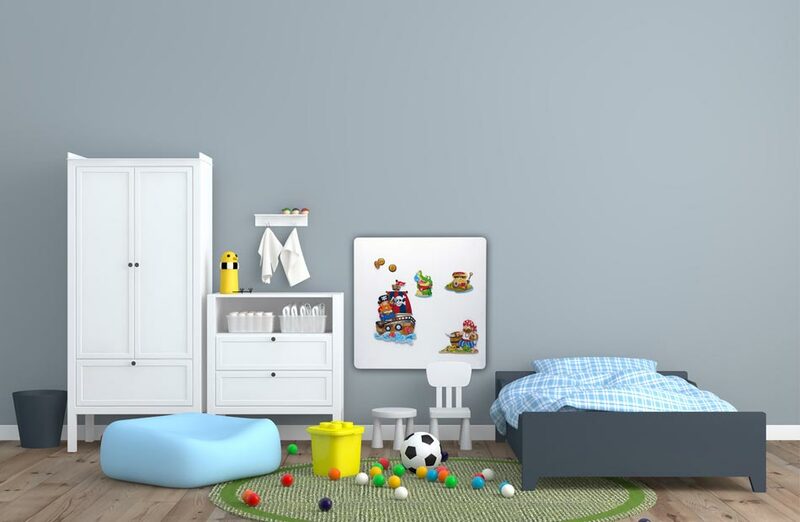 The very discreet design of this model also authorizes you to customize it, because you can paint it, decorate it with stickers according to your desires and according to the atmosphere and the colors of your room. 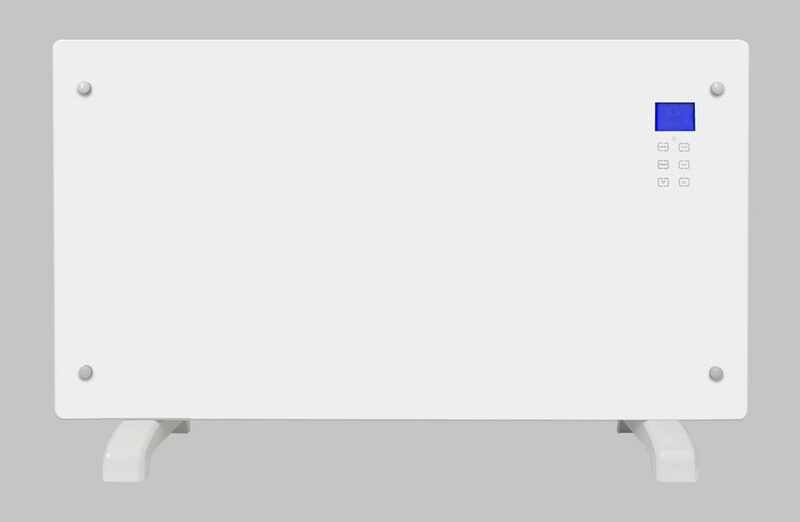 Discover our radiator with ceramic inertia 1000W and enjoy a soft heat, diffused in a homogeneous way for an optimal thermal comfort. Its advanced technology allows you to save up to 25% on your energy bills. How? 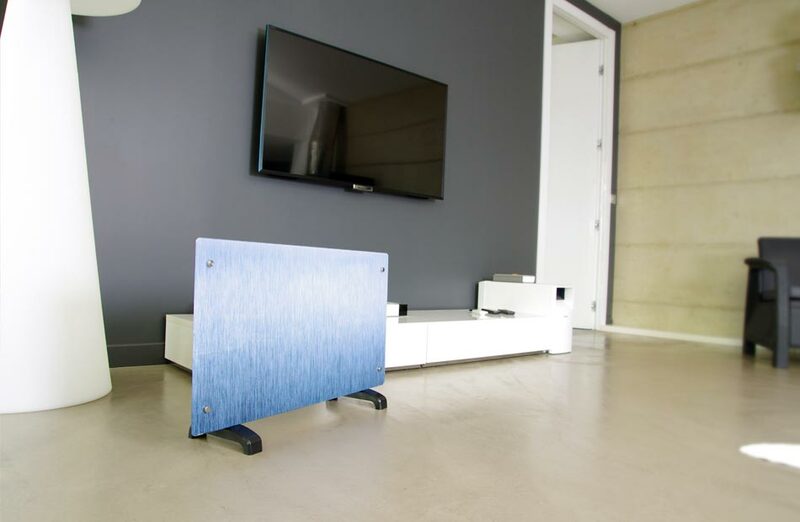 Our radiator is capable of storing heat and continues to warm the room pleasantly up to 30 min after shutdown of the thermostat. 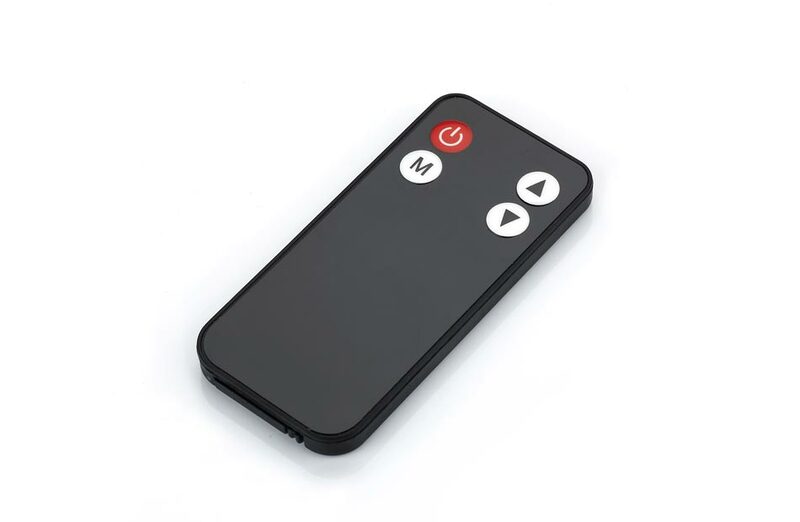 From the LCD screen or with its remote control, you can adjust the temperature and programs directly from your sofa. 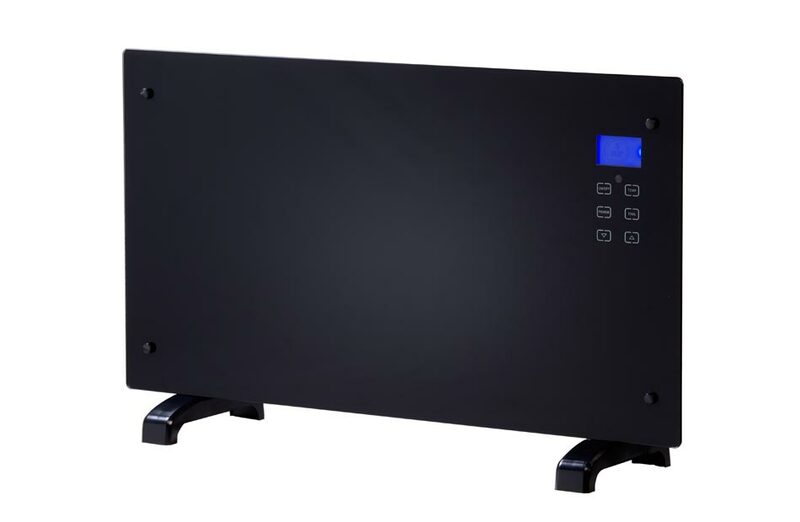 You benefit from the “comfort mode” or the “night mode” to have the ideal temperature when you enjoy your room and an ideal sleep thanks to a regular temperature. 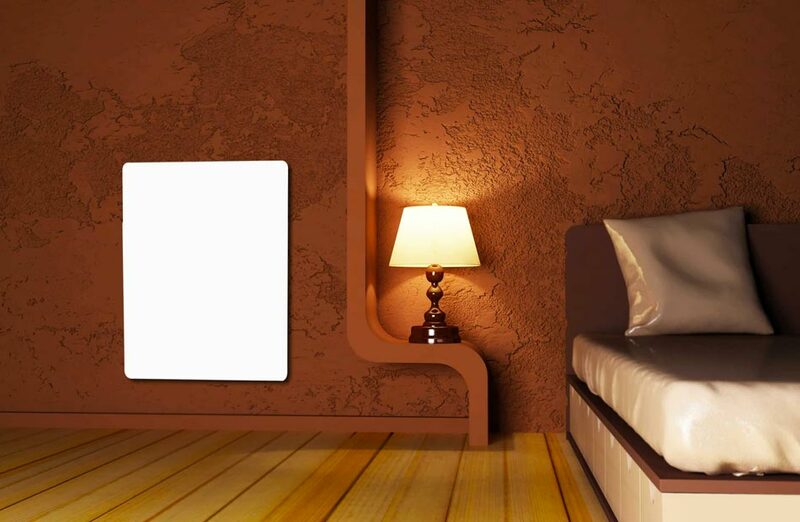 With so many parameters, you are the master of your heating and you reduce your energy consumption! 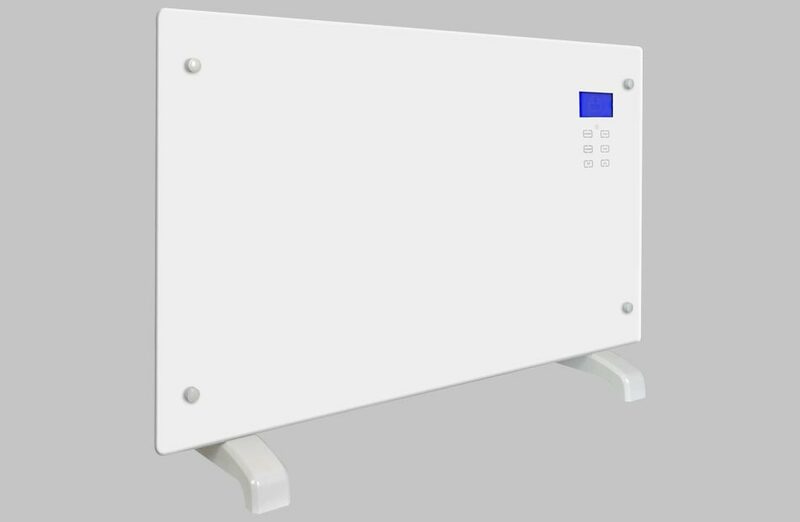 Its power of 1000W allows you to heat a room of about 15 m2. 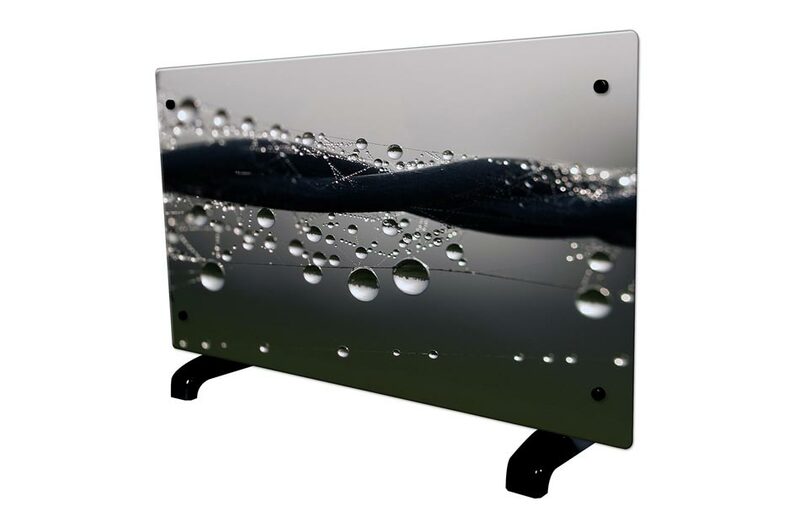 You think that a ceramic inertia radiator is necessarily a thick and energetic radiator? Think again. 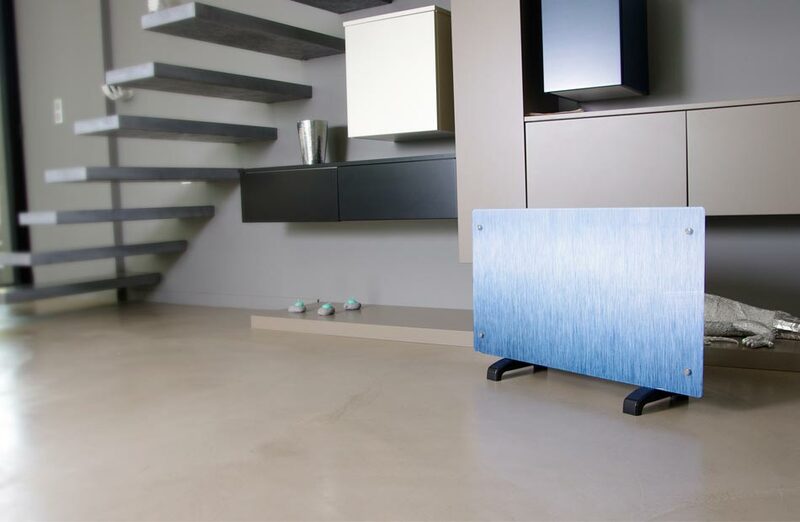 Our radiator with 1500W ceramic inertia is extra-flat: it measures only 5cm thick. 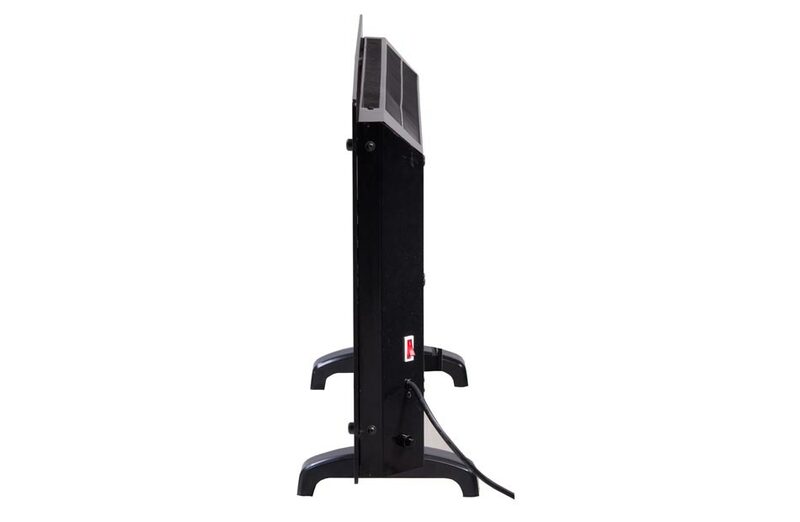 Its power of 1500W makes it possible to heat a room up to 20m2 while diffusing a soft and pleasant heat. 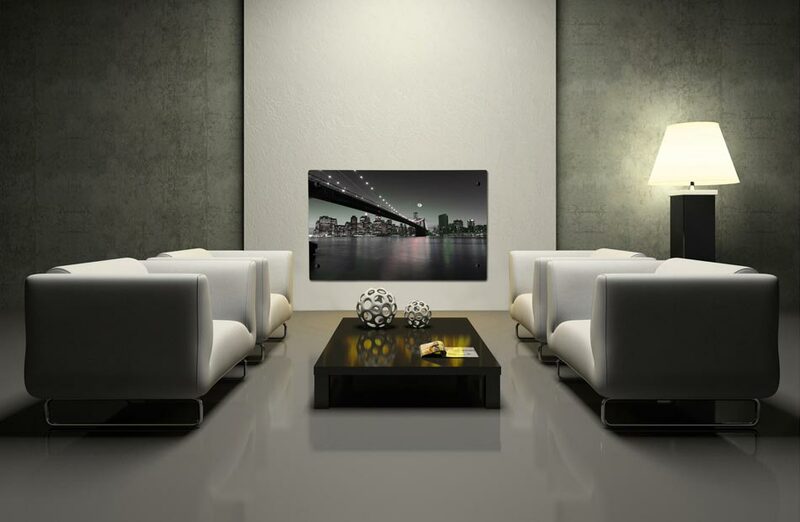 Its simple, sleek design fits perfectly into your decor. 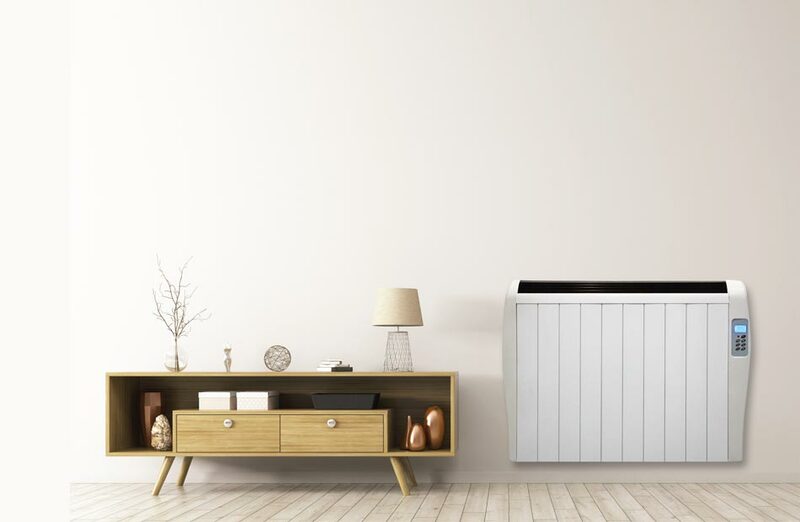 Fully programmable, you can select different modes and set it so that your daytime consumption is as economical as possible. 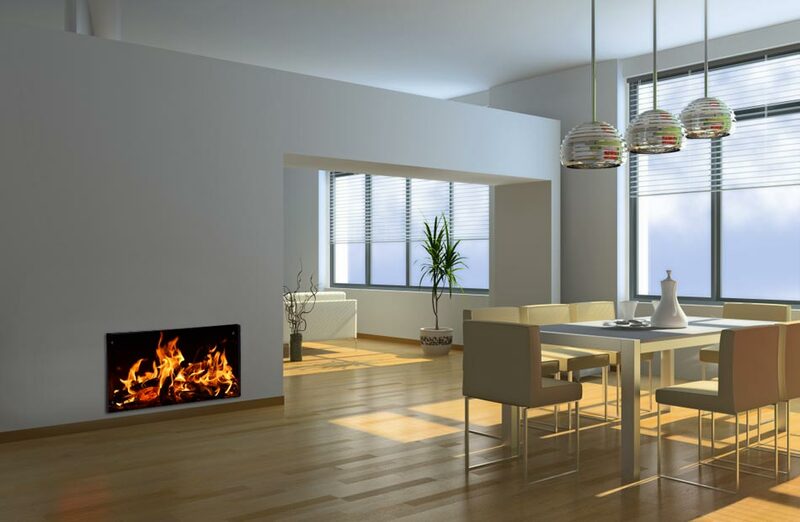 Yes, when no one is at home, it is not necessary to heat the room at more than 19 °. 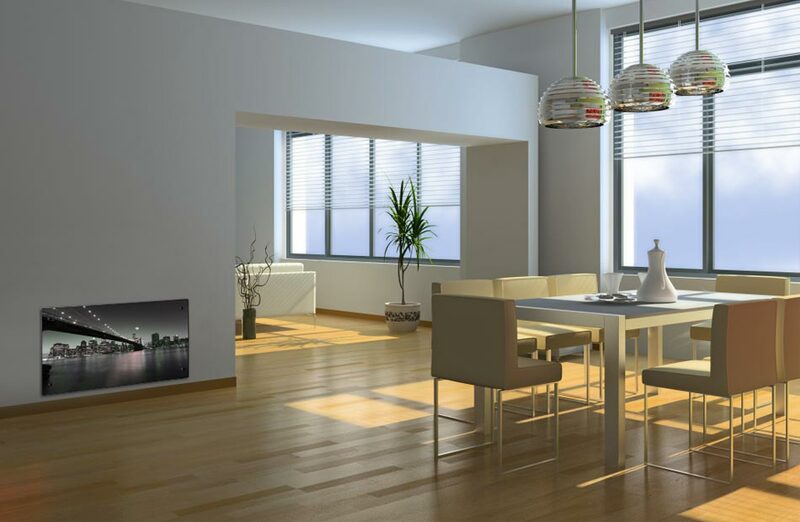 On the other hand, you will love to arrive home, after your working day, in a room pleasantly warmed to 21 ° without having to take care of it. 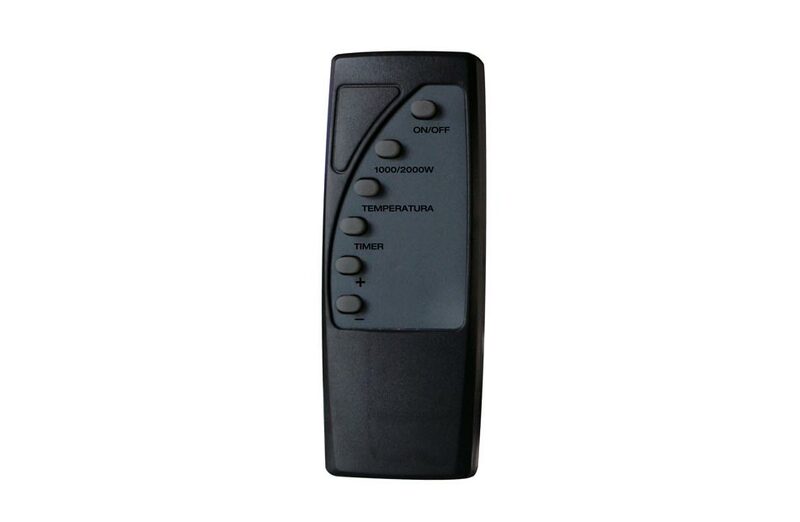 Using the adjustable electronic thermostat, setting and controlling your heating will be a snap. 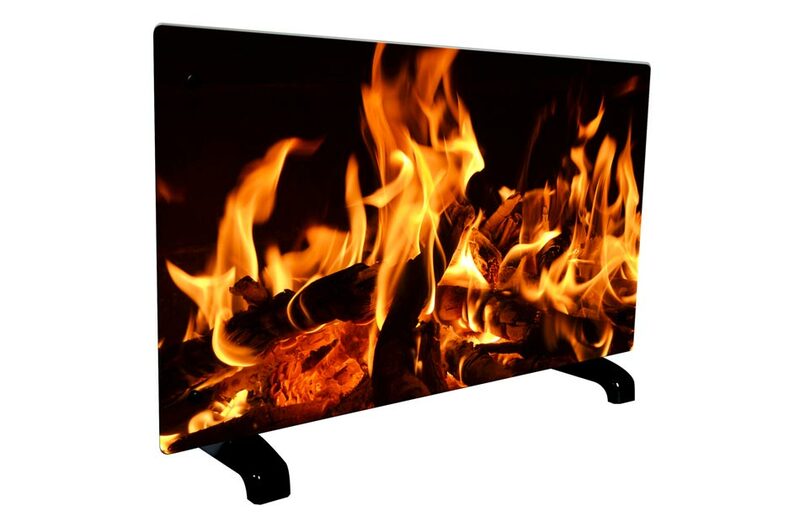 The whole family will benefit from an excellent thermal comfort! 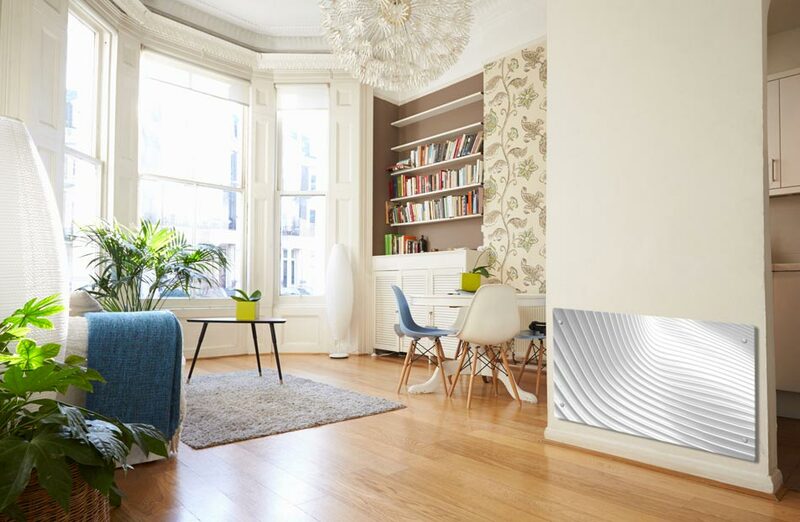 Let yourself be seduced by the soft warmth of this inertia radiator. 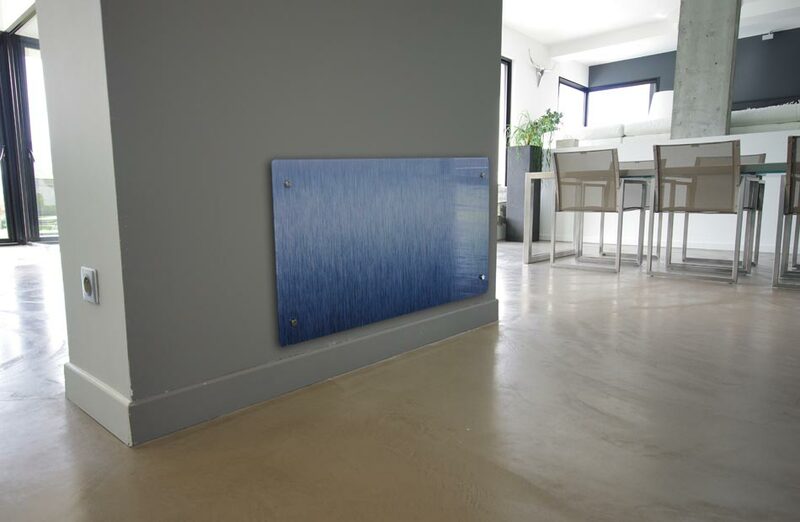 Ceramic inertia radiators allow up to 25% reduction on your heating bills, since they continue to heat 30 minutes after the thermostat is turned off! 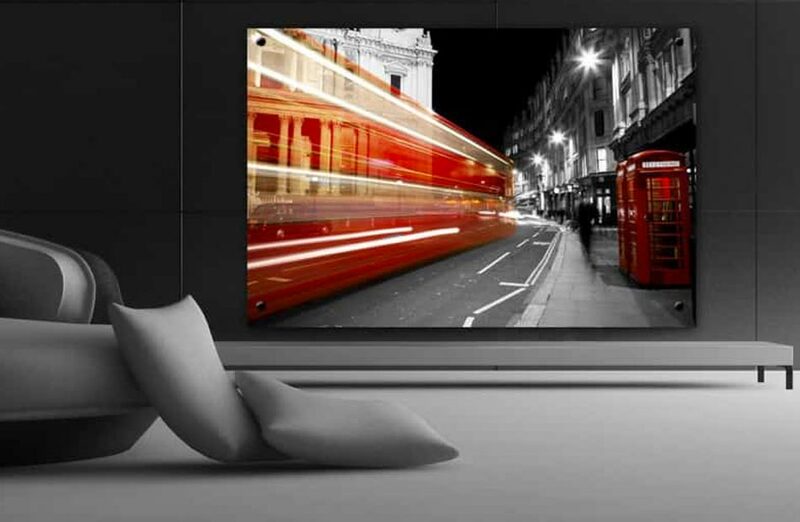 Install, program and enjoy! 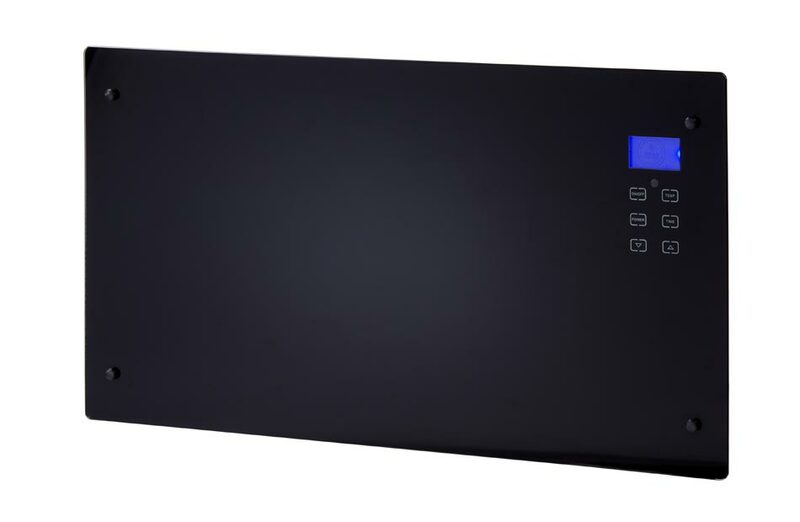 With its integrated LCD screen and its supplied remote control, you will be able to easily program your heating preferences (temperature, time, day or night mode…). 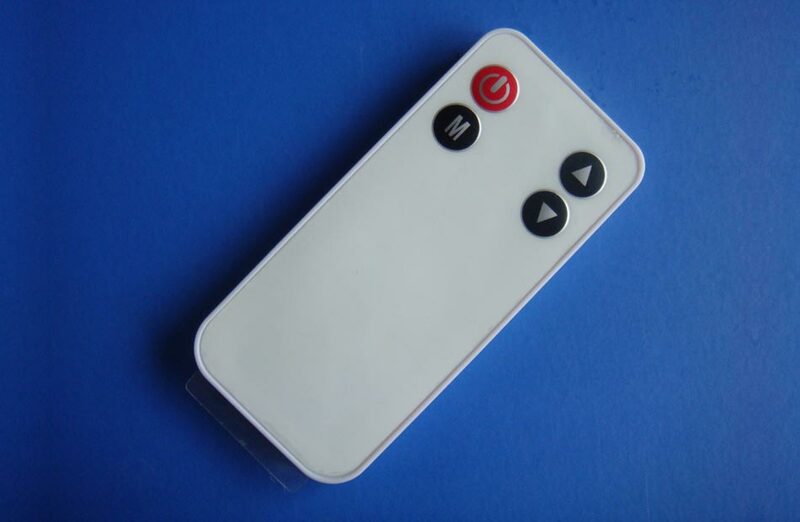 So, once installed, you will be able to forget it! 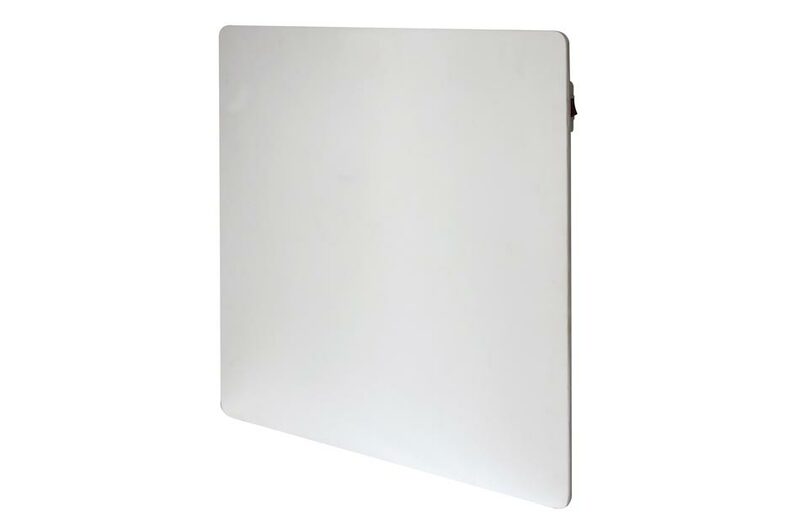 On the design side, the LCD temperature control screen and its thinness (5 cm thick) reinforce its aesthetic and modern side. 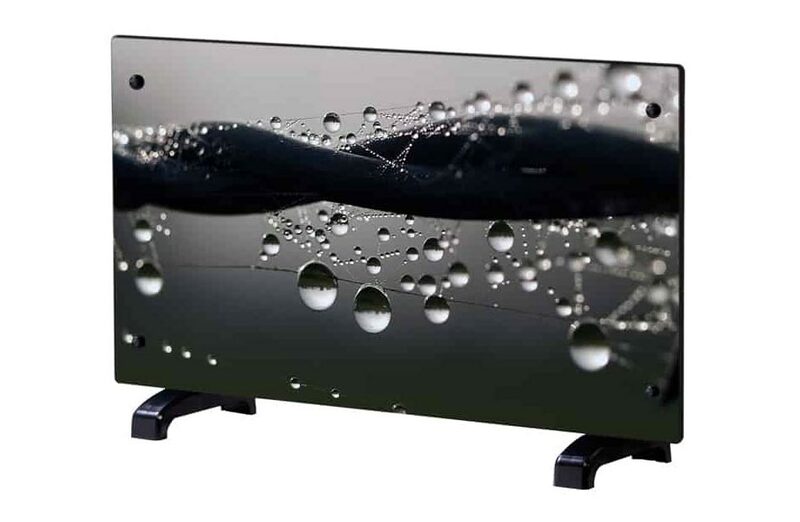 The sobriety and chic of black are combined with the effect provided by the glass on the facade. 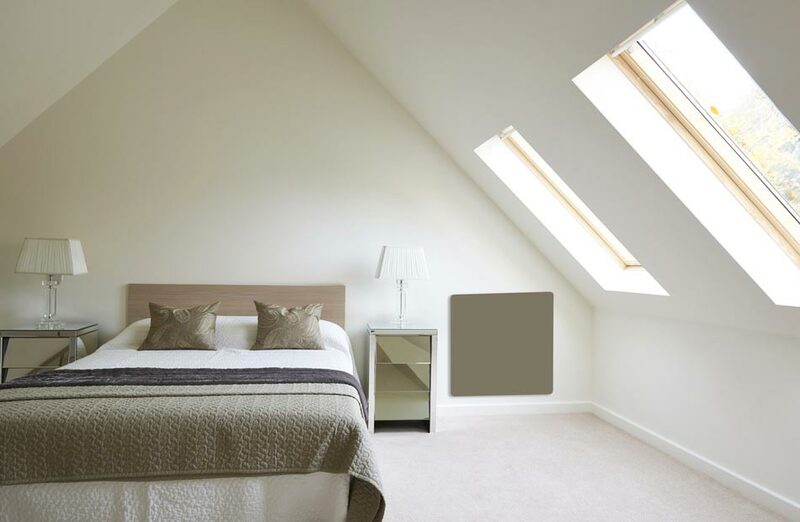 The most beautiful effect, wherever you choose to install it. 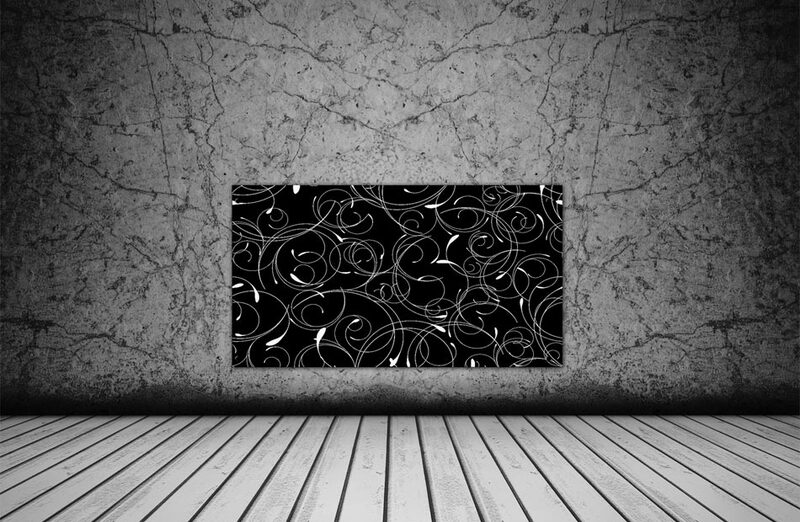 Deco advice by Chemin’arte: for a masculine and graphic spirit, choose black, and use it as a reminder touch via a piece of furniture, the sofa or a headboard. In a predominantly light space, black intervenes to structure the space, to rhythm it, a bit like punctuation in a sentence. 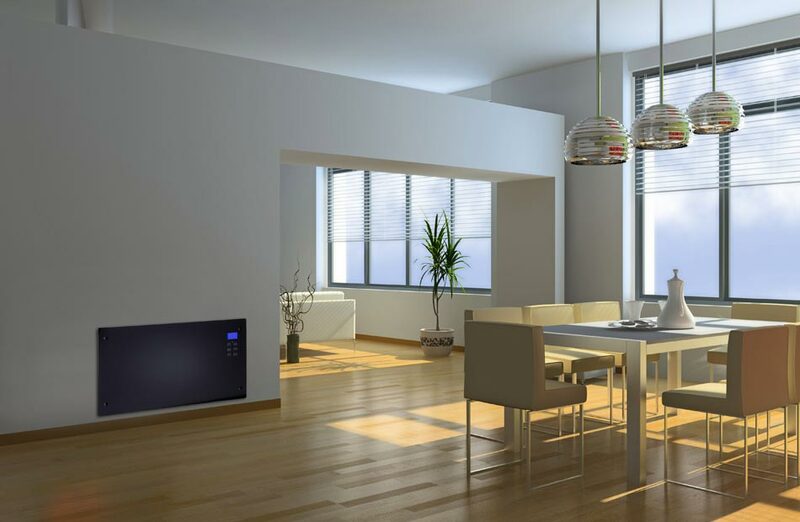 The most daring will choose a total black decoration, where the black decorative radiator can be forgotten. 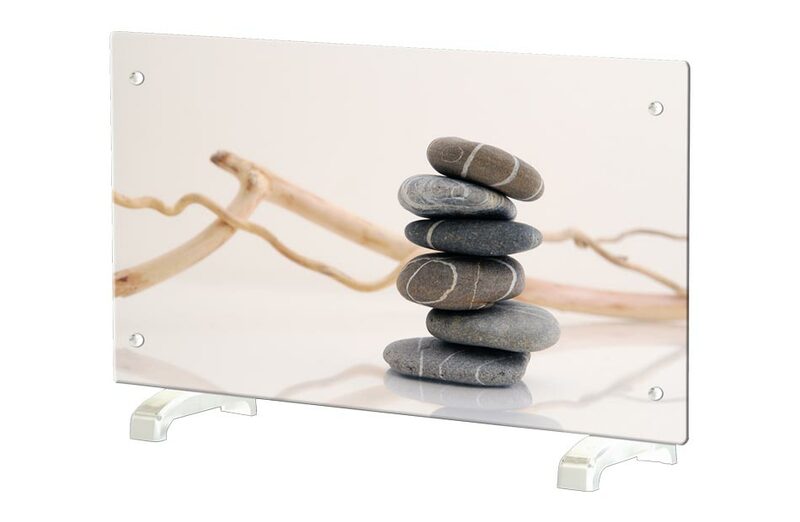 To avoid the sad and monastic effect, complete the decoration with golden objects and frames. 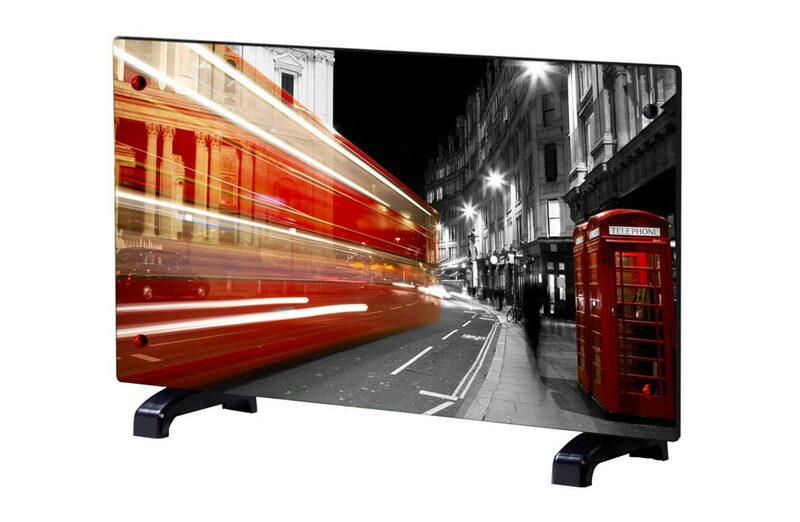 Theatrical effect guaranteed. 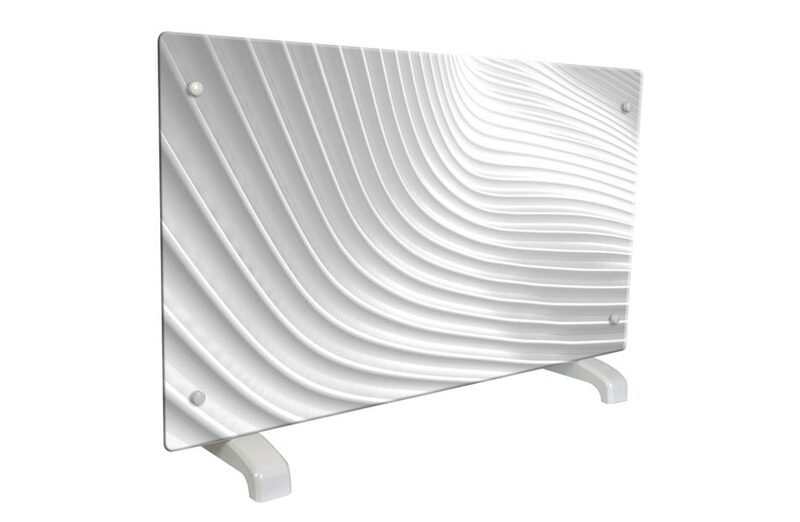 This immaculate decorative radiator combines the light of pure white and glass. 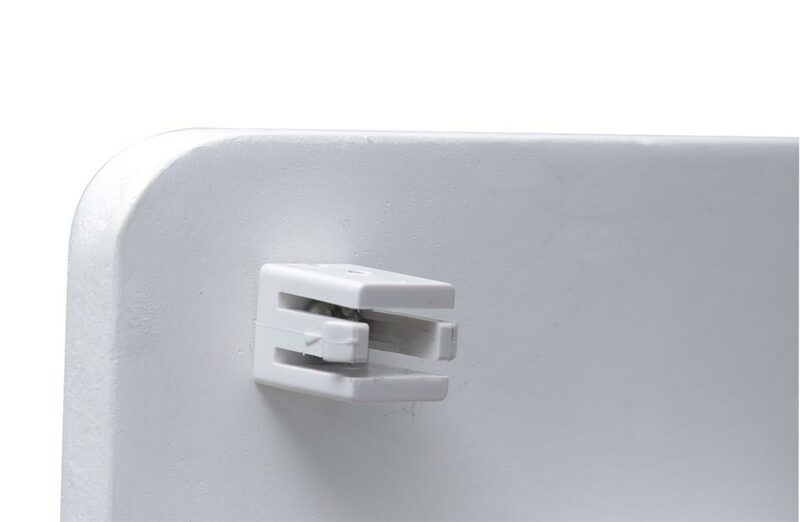 Ideal in a predominantly light or monochrome white decoration, this model is also perfect as a luminous touch in an atmosphere with light walls but full of strong colours. 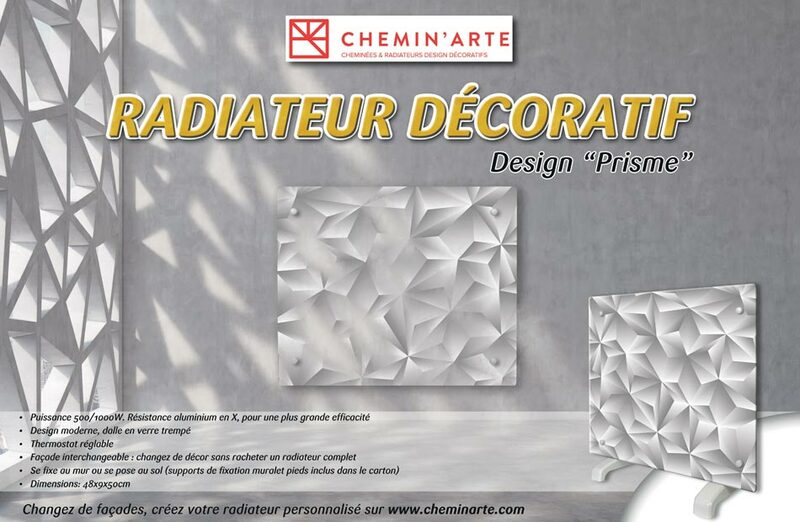 Deco advice by Chemin’arte: White illuminates, enlarges, while black is more daring and its character in decoration is very marked. The total white look deco must also be punctuated by touches of colour, never more than three. Dare to use emperor green, peacock blue, fushia roses and Basque reds to make your mark. 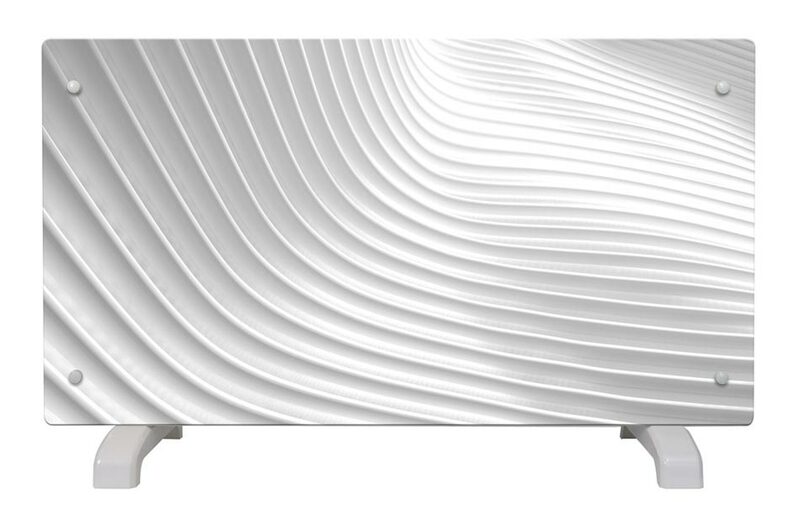 If your electric heater was also a true design object? 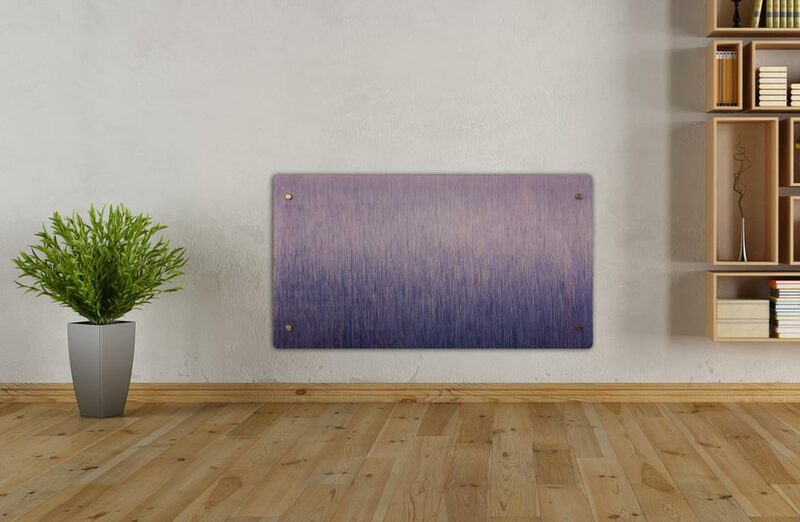 With the decorative heatr prism, you have two heating modes selectable from the radiator: built with powerful technology, you get a constant heat while controlling your consumption with temperature control thermostat. 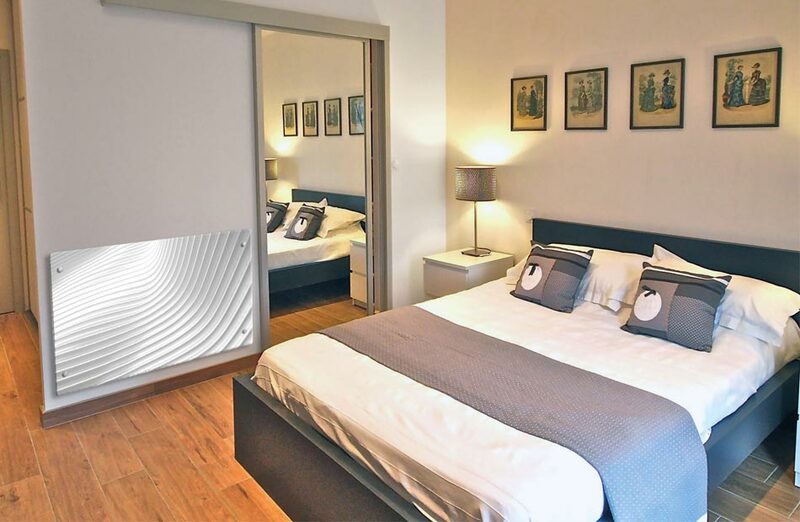 The decorative radiator Prism is ideal for heating a room of about 15 m²: its modern design, will bring an original decorative touch to your room! 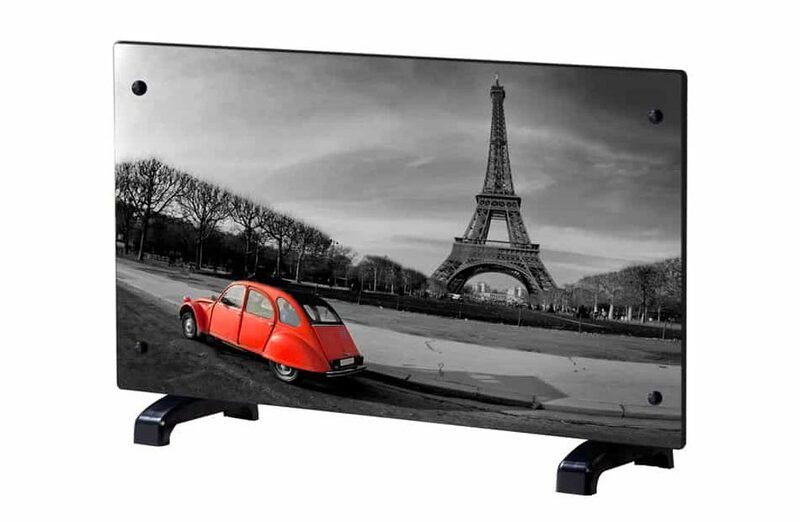 Attached to the wall or floor, it fits all your needs. 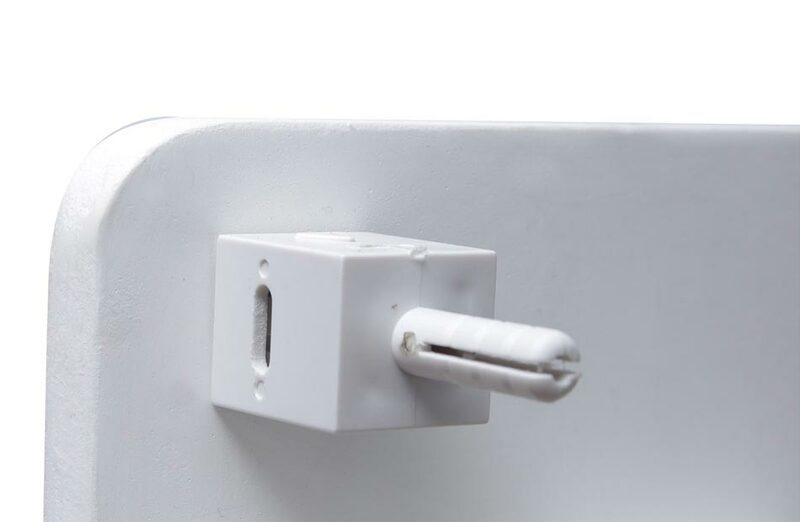 Its quick and easy installation allows you to use immediately after installation: simply plug it in, set the thermostat temperature and enjoy a pleasant heat, which does not dry the air. 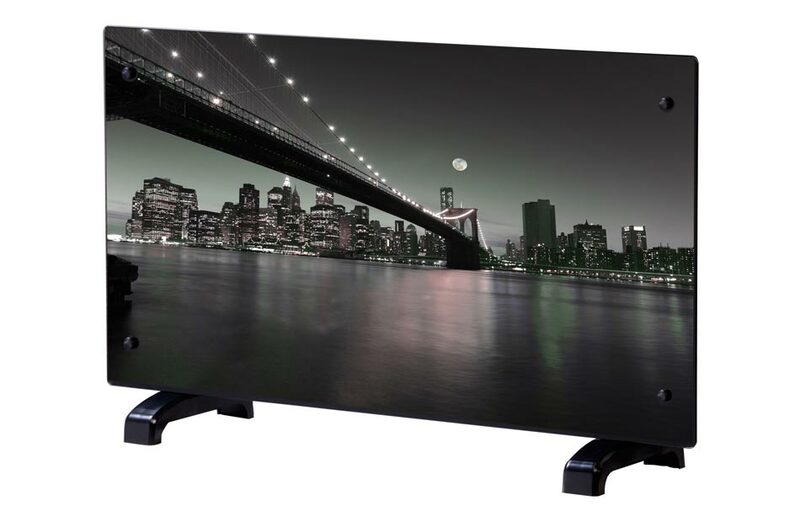 You can immediately take advantage of its performance and elegance! 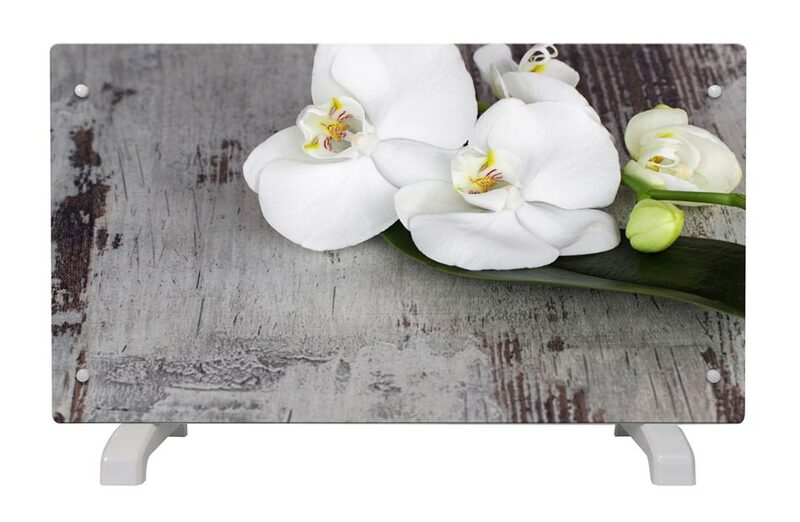 The decorative heater with orchid motif fits easily into any interior and brings a lot of charm: it is a true picture which just beautify your decor while taking care of your comfort by distributing a uniform and pleasant heat. 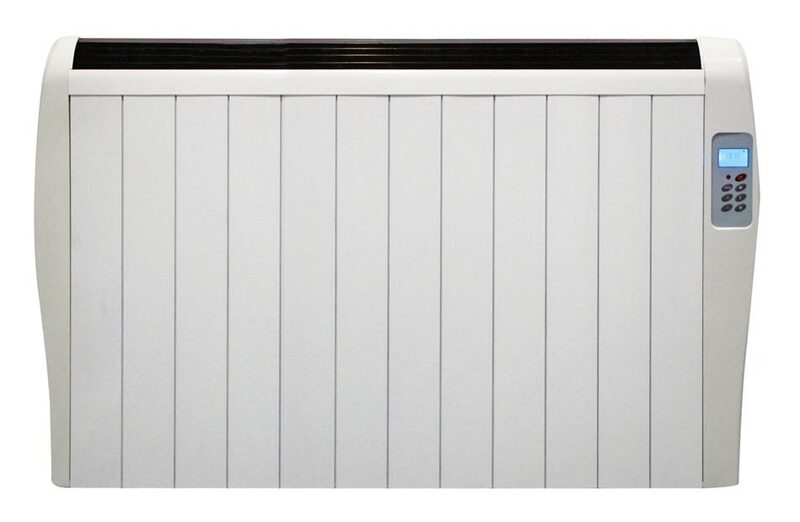 The body of the black steel radiator emphasizes its elegant and harmonious design. 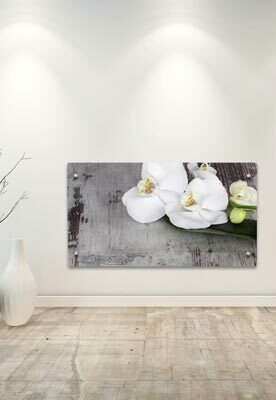 The orchid motif inspires calm and relaxation. 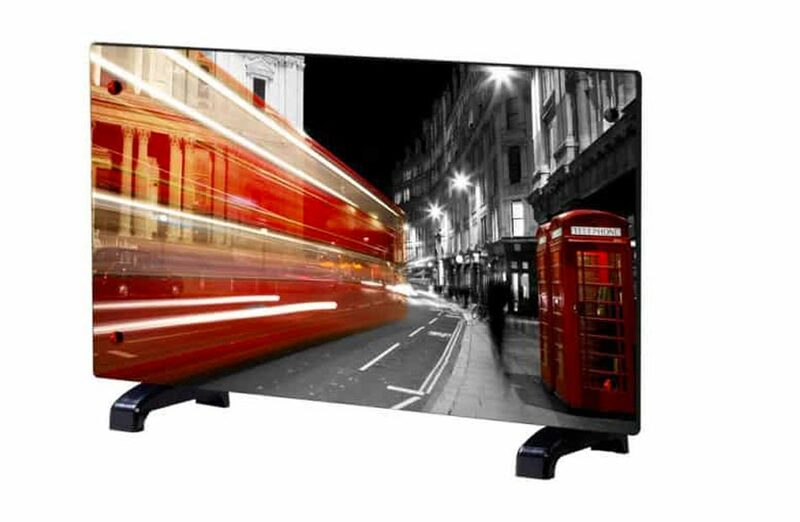 Thus it will well find its place in the living room or in the master suite. 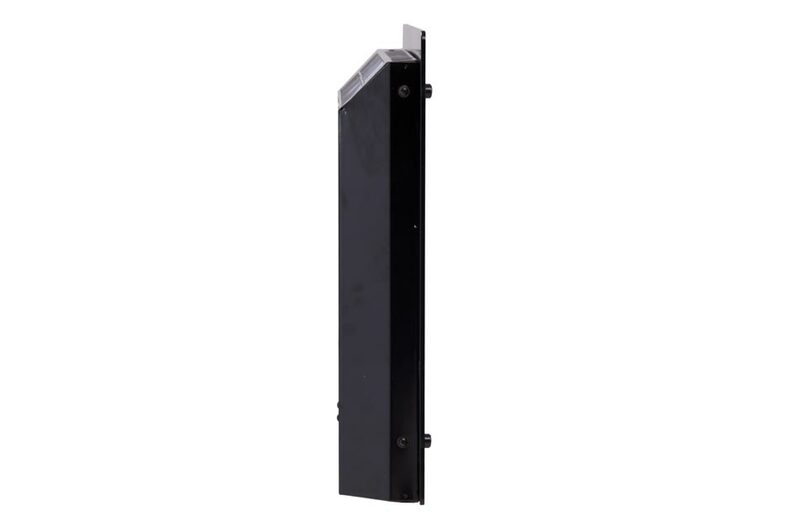 High performance and decorative, this heater will heat a room of 30 m² and is maintenance is free. 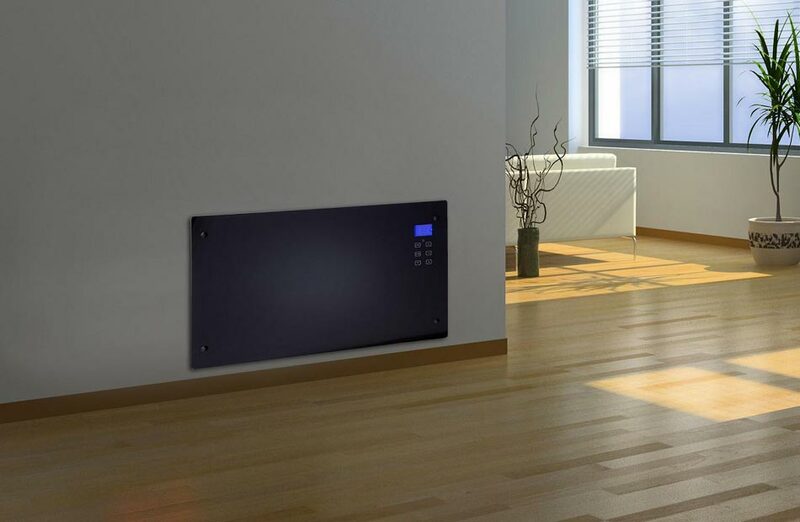 With its thermostat, you regulate the temperature to your needs, depending on your lifestyle. 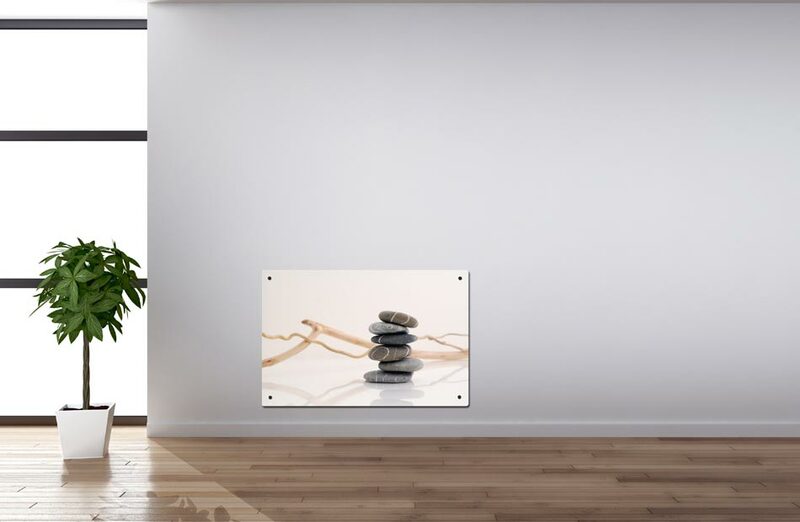 Attach to the wall or floor standing, decorative heaters combines design and comfort: a simple and quick to install heater! 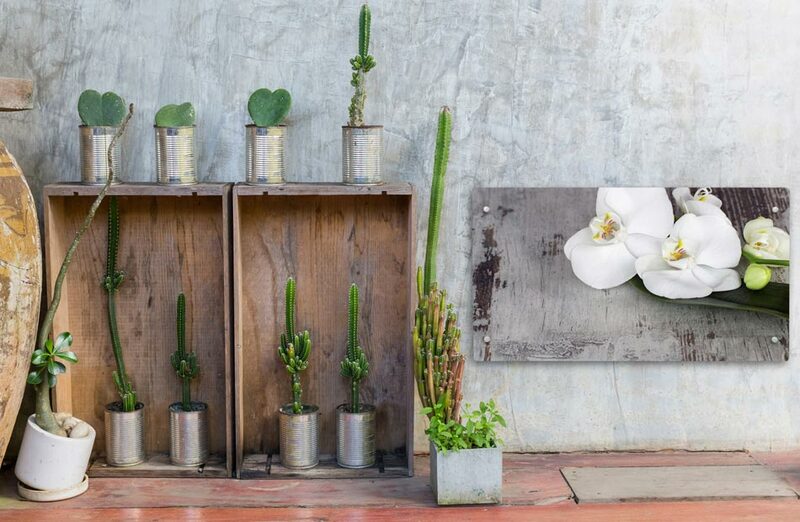 The heaters are also today decorative objects ! 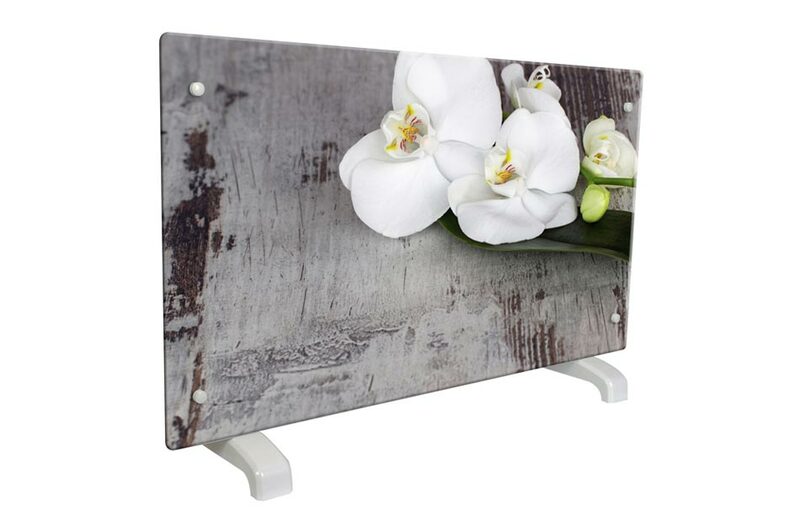 You want to bring a vintage touch to your interior? 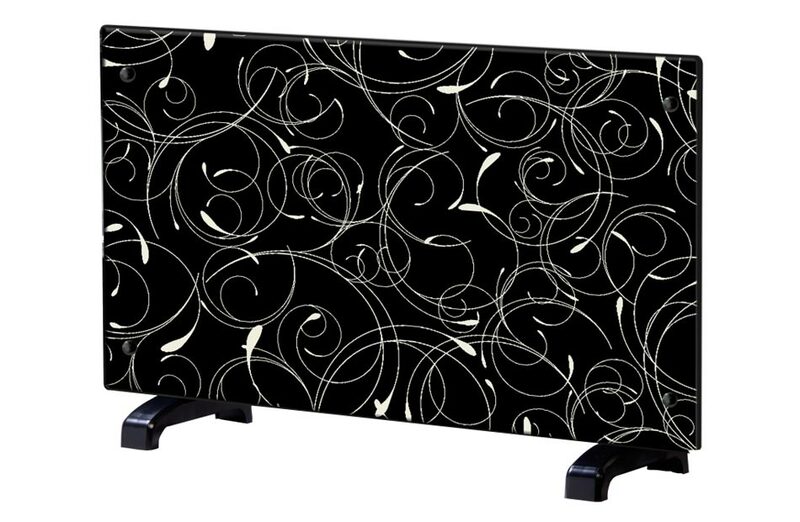 Then you’ll love the decorative radiator design Wave! 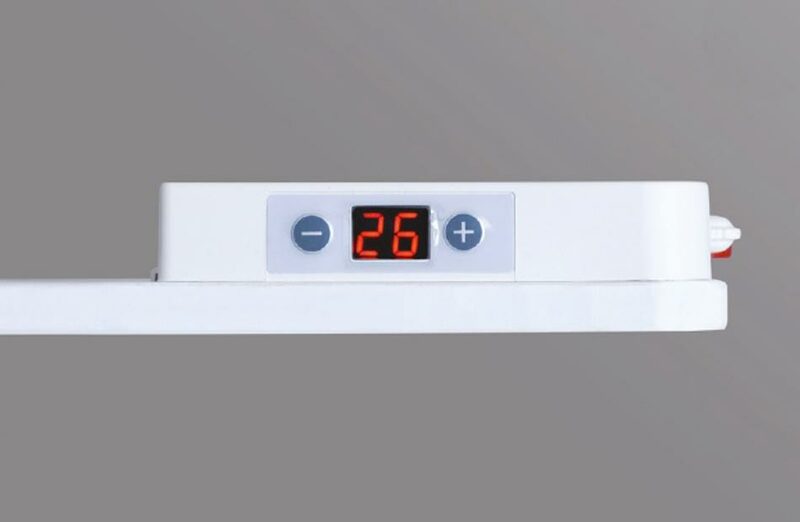 This original and modern design combines high efficiency and controlled consumption with its temperature control thermostat. 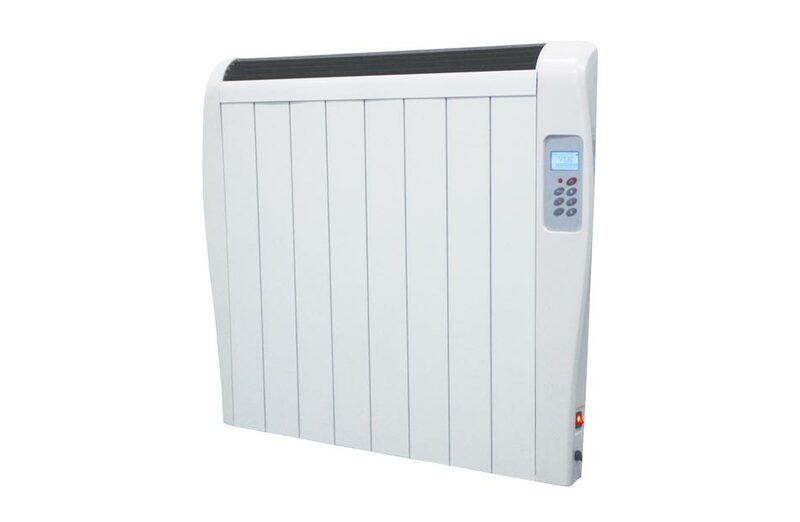 It has two modes of heating 1000 and 2000W selectable from the radiator and you can heat up to 30m². 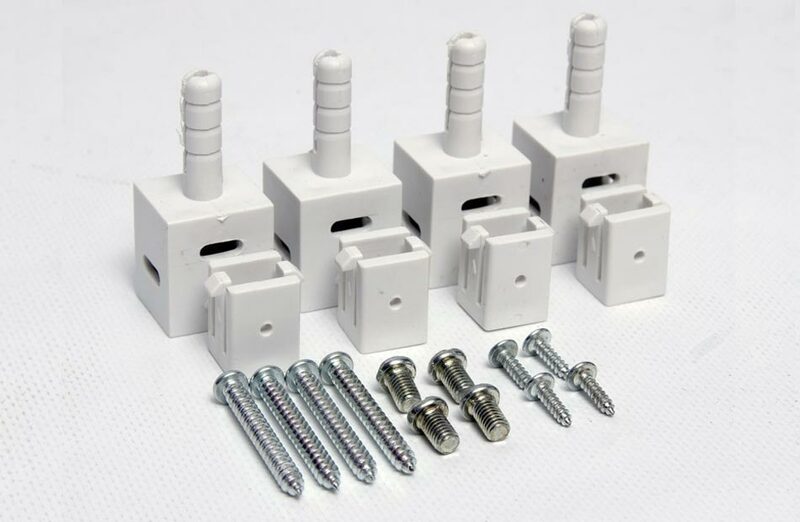 Depending on your needs, you can fix it on the wall or put it down: installation takes only 5 minutes. 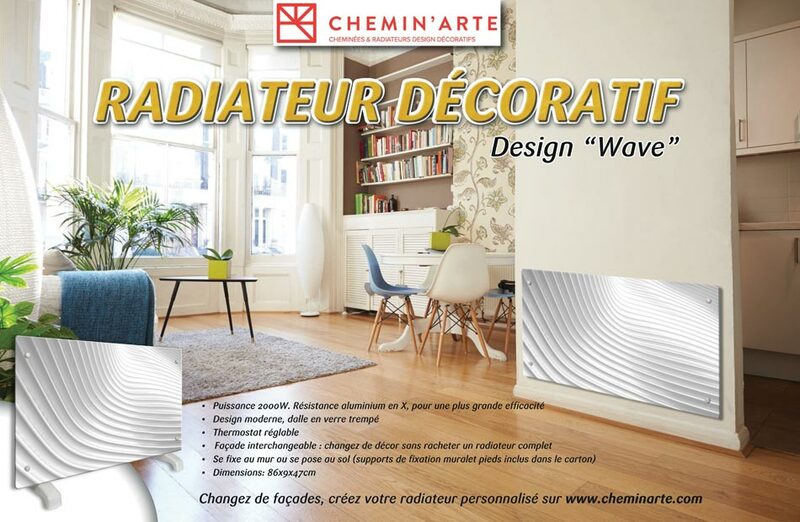 Radiant convection does not dry the air and deliver a gentle heat: with the decorative radiator design Wave, you sublimate your interior while enjoying comfort! 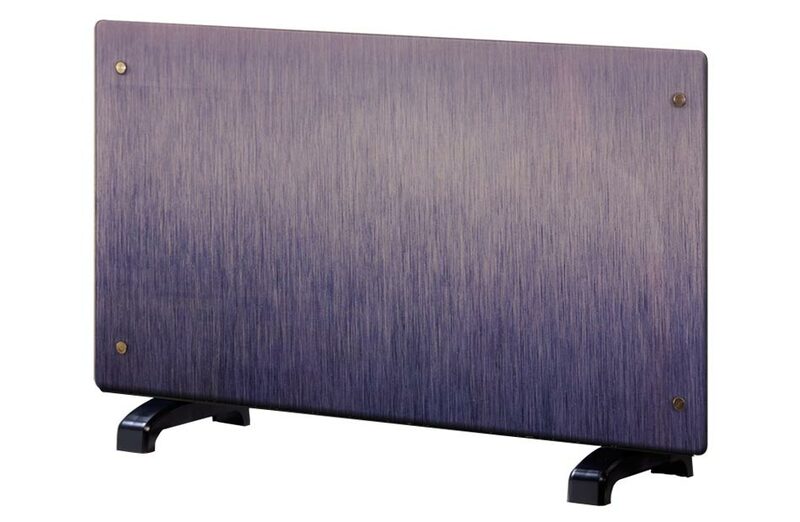 Get the spirit of New York with this elegant design, enhanced by mauve and purple tones for a urban atmosphere. 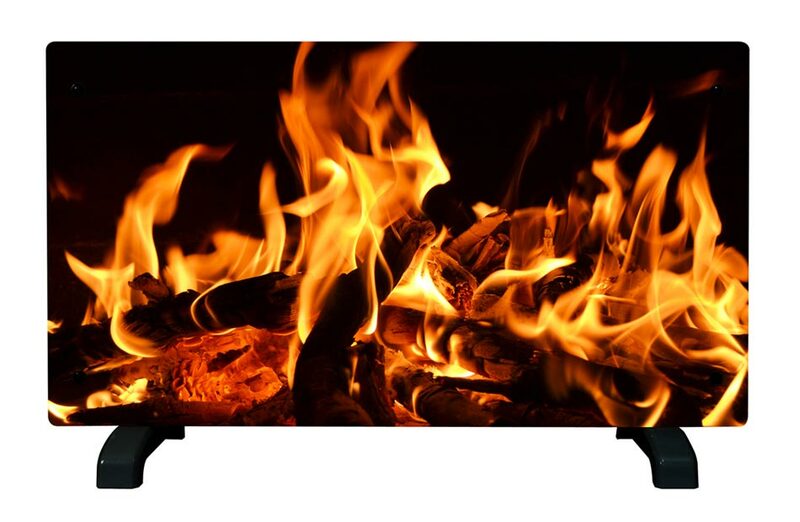 We design decorative electric radiators but also electric fireplaces. 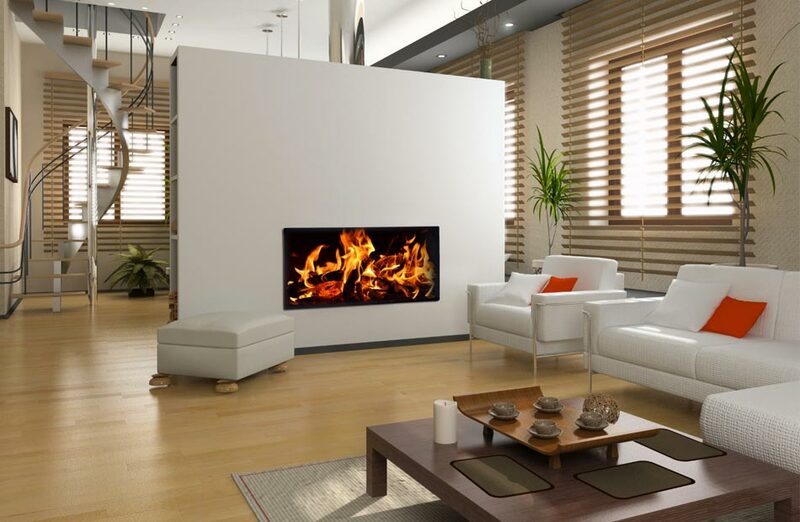 It was in the middle of a team brainstorming session that we had the idea to propose this trompe-l’oeil design like a fireplace fire. 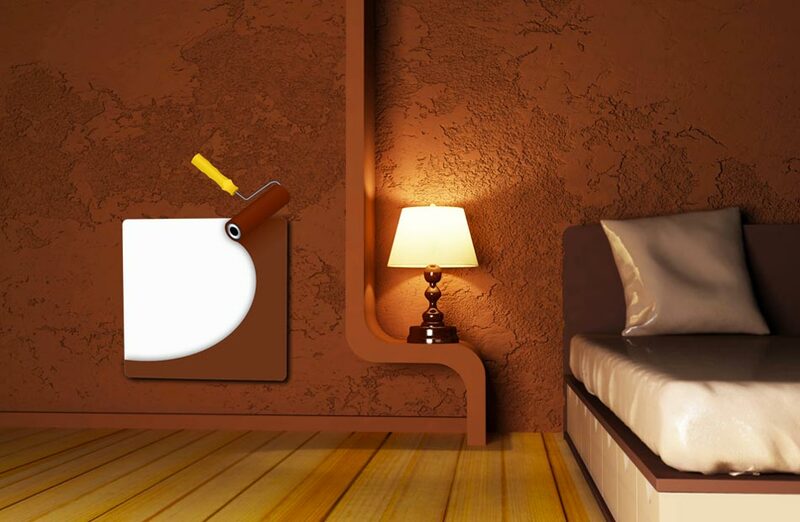 This model is also in line with the trend of visual impostures, also available in wallpaper and wall stickers. 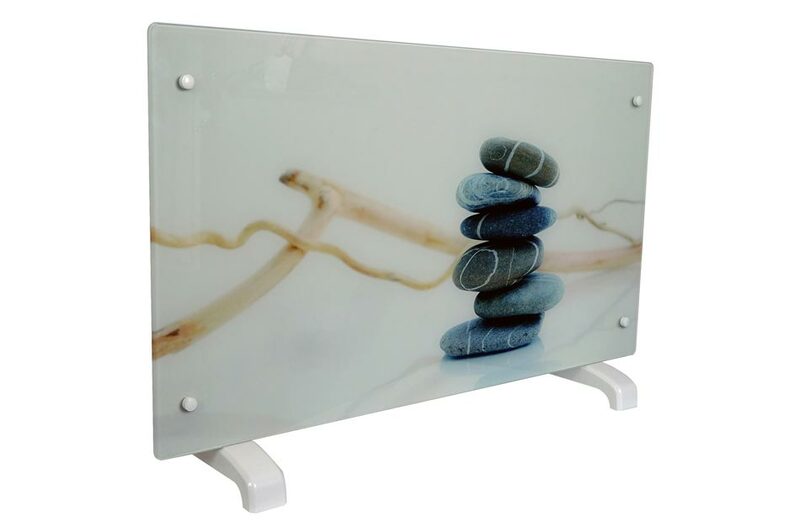 Something to add a subtle touch of humour to your room or living room. 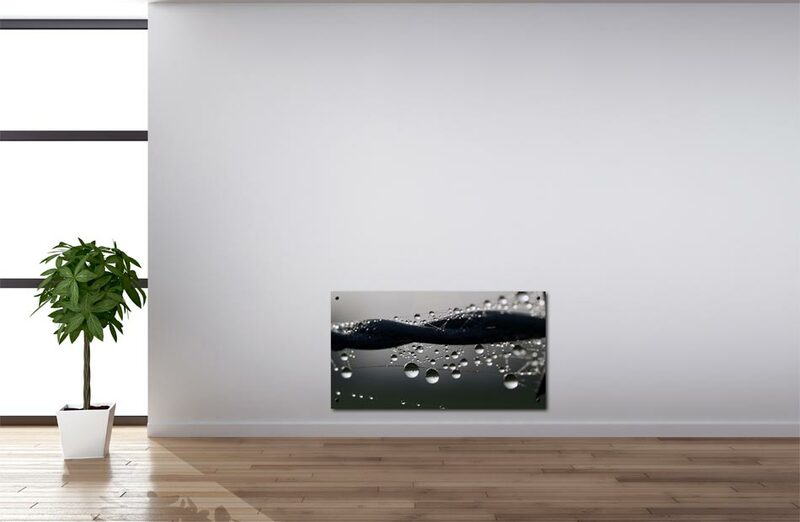 This decorative radiator is inspired by the industrial trend with this trompe l’oeil material, where the glass of the façade reinforces the effects of reflections. 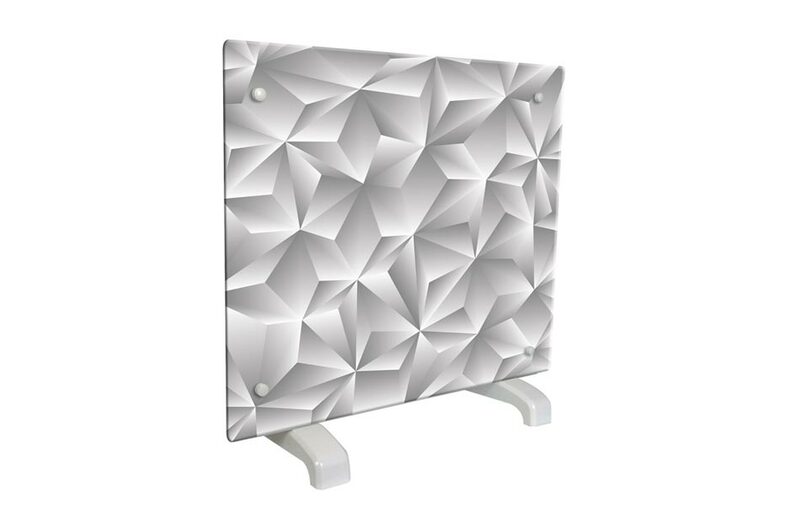 It will be perfect in a kitchen as a reminder of a credenza or a stainless steel worktop. 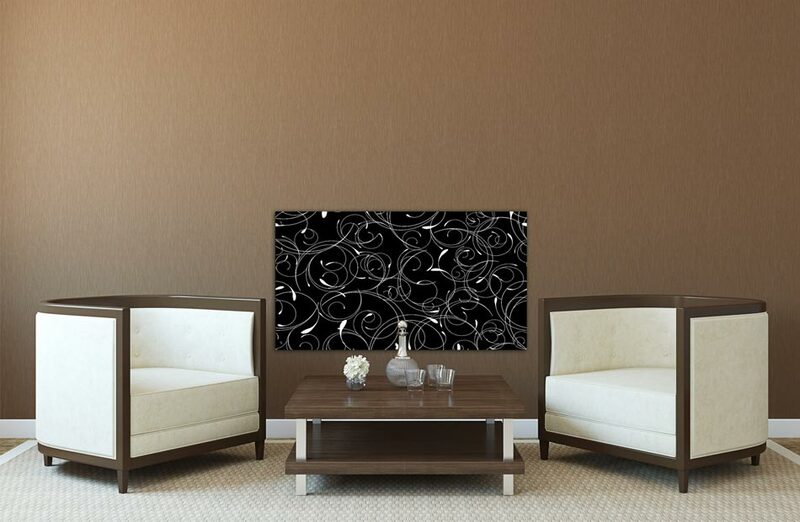 In the living rooms, this metal and design touch will bring a very urban and contemporary spirit. 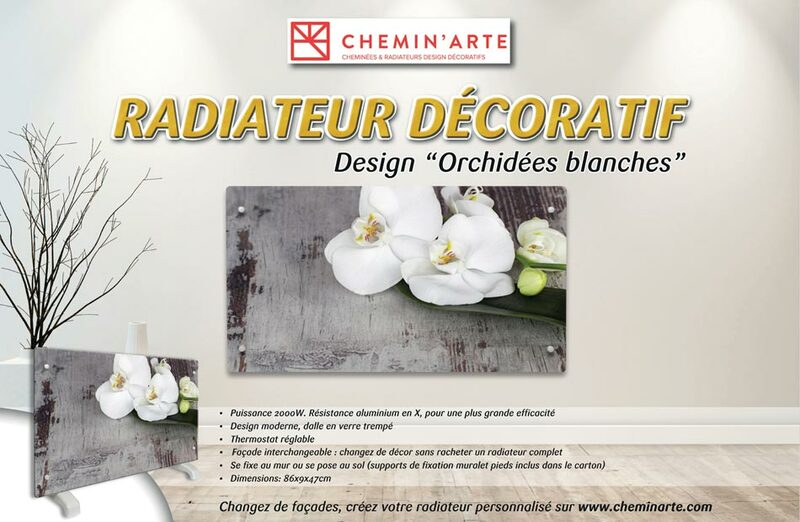 Decoration advice by Chemin’arte: to avoid the coldness of excess metal, your allies are wood and materials such as wool, thick carpets, oversized objects such as clocks, imposing street lamps. 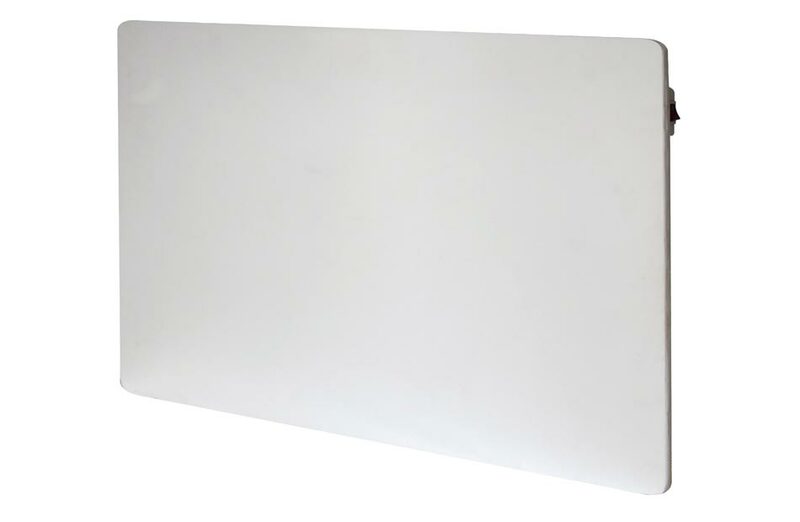 Play the card of warm-toned lighting to compensate for the coldness of the metal. 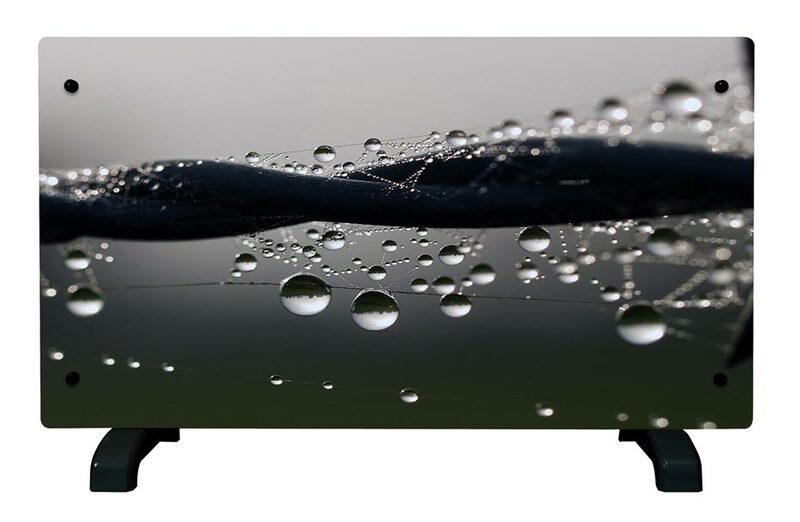 The net in transparency, a black and white design full of elegance and sweetness, for a zen atmosphere, convenient to the relaxation. A subtile and restful atmosphere. 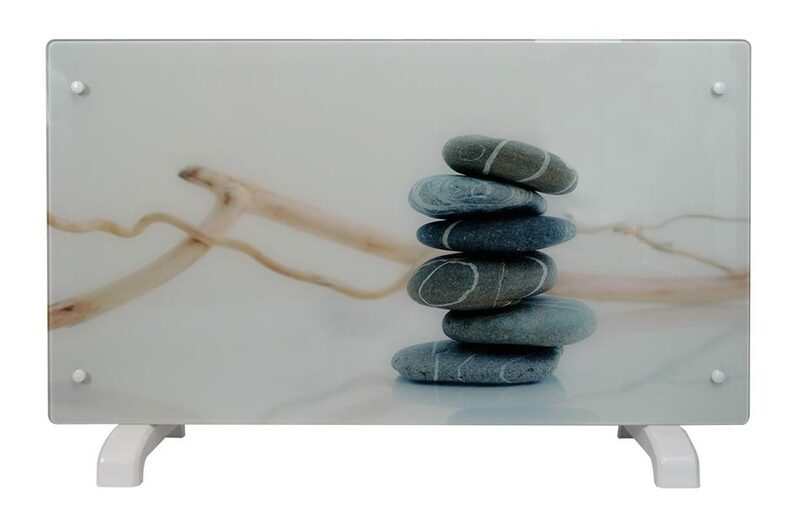 Neutral colors, purified picture evoking the quiet and serene atmospheres of Japan, this model will find its place in soft atmospheres, inviting at the rest and in the serenity. 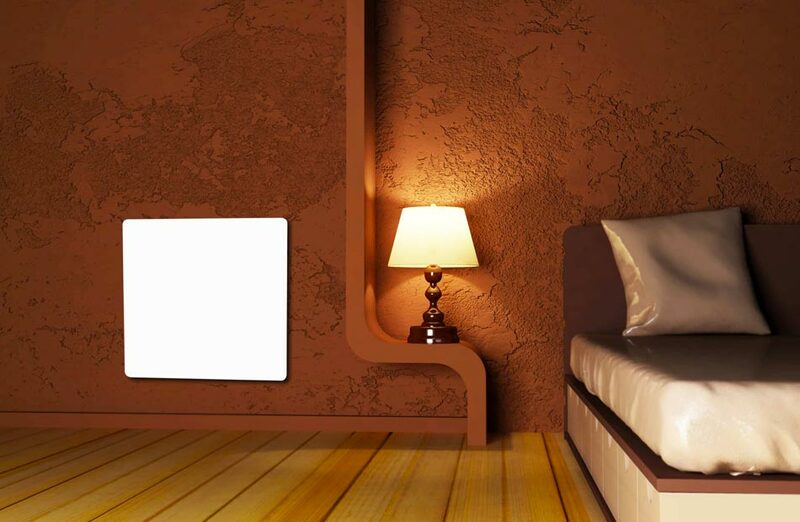 Presented here in a bedroom, it can integrate as well a lounge or a bathroom, in wink of eye to the atmosphere of spas. 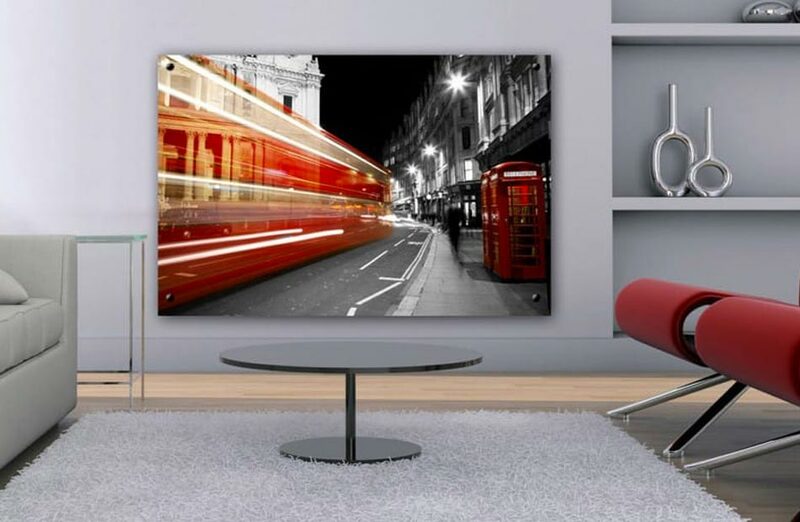 The red, the black, the grey for a resolutely bright and modern touch. 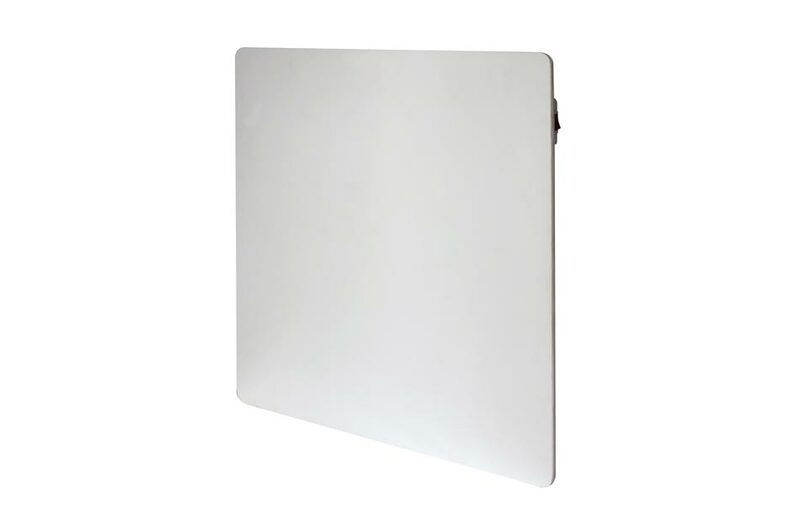 Ideal to give a blow of energy to a classic or monochrome decoration. 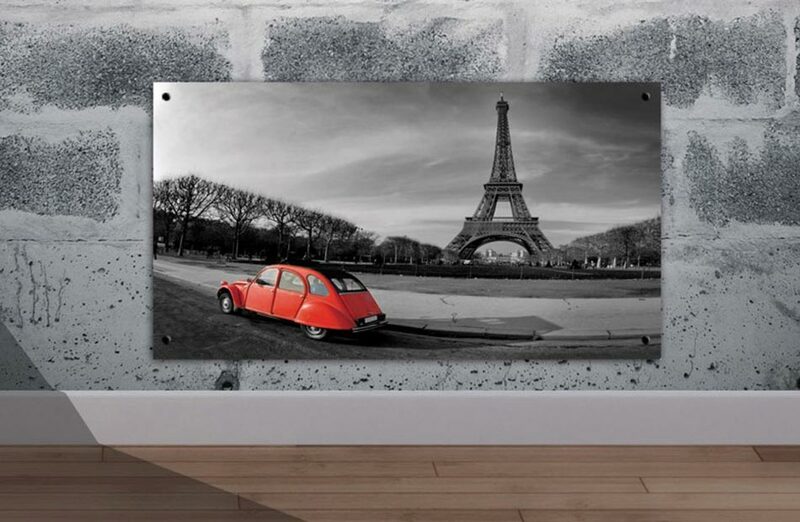 This design is retro and at the same time elegant but on a note of humor, and a tribute to the most beautiful city of the world. 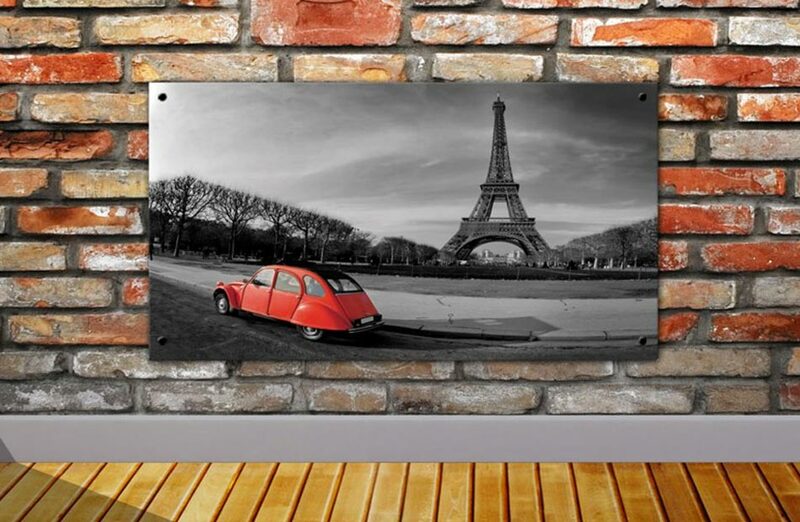 The spirit of Paris in your house. 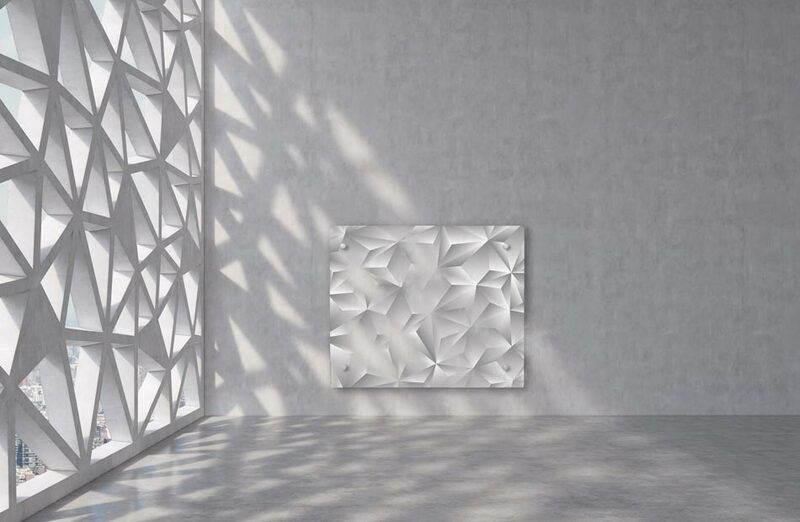 Inspired by the baroque trends and the retro motives, Arabesque is at the same time discreet and original, to find its place in all the rooms. 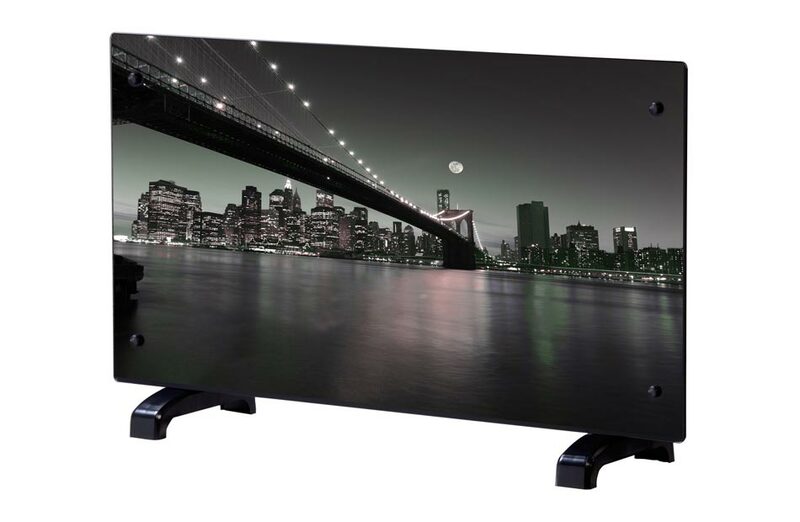 Choose among all our panels the one who will sublimate your inside. 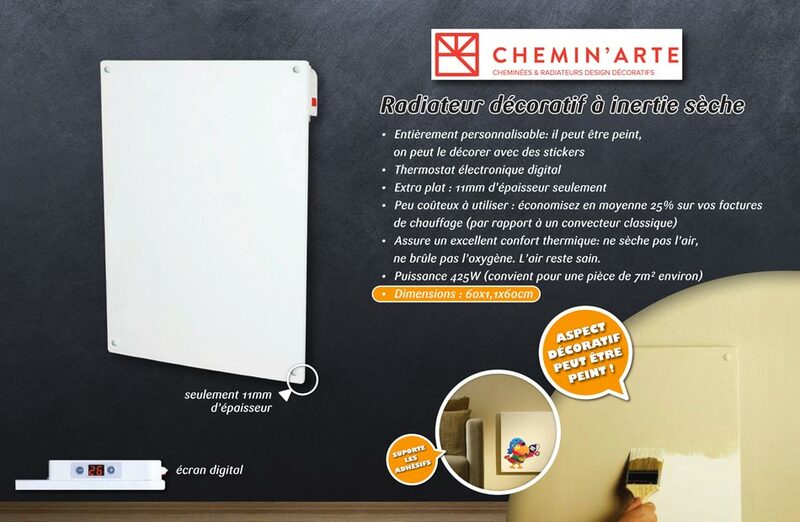 You already own one Chemin’Arte heater and you wish to change the picture? We suggest you to choose the model which corresponds to your desires of moment.